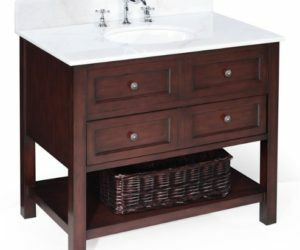 Do you have a builder-grade vanity in your bathroom? 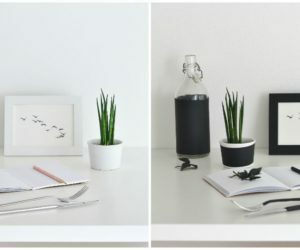 A most boring, generic piece? 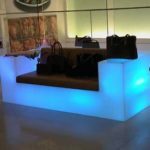 Or one that simply doesn’t match your style or personality? 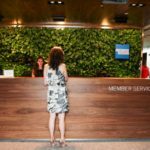 If so, you might be interested in freshening things up. 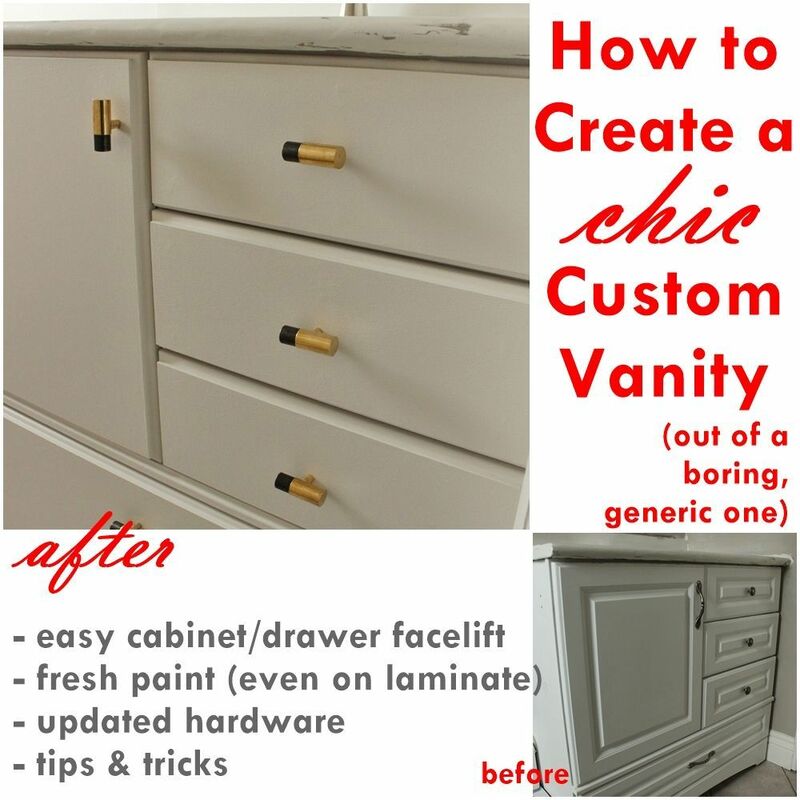 If replacing the entire vanity itself isn’t in the budget, however, you’ll be happy to know that you can give your old vanity a facelift and transform its ho-humness into a chic, stylish piece that really says you. This isn’t a hard process. 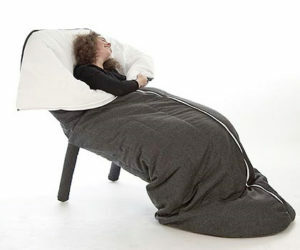 Neither is it incredibly night-and-day, depending on the old vanity that serves as your jumping-off point. 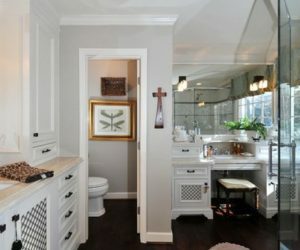 But making a few subtle changes (e.g., flat-faced cabinets and drawers, fresh paint, and new tasteful hardware) will have a huge impact on the overall updated feel of your bathroom space. 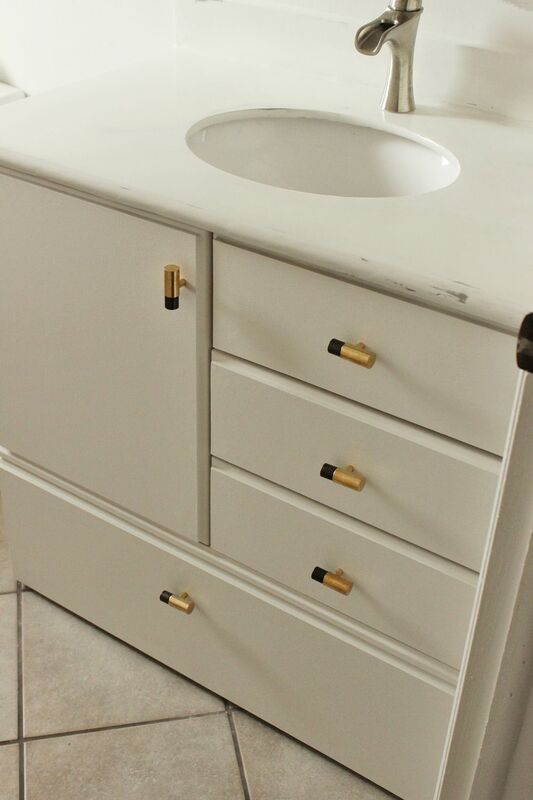 The first step in this vanity updating process is re-facing your cabinet doors and drawers. 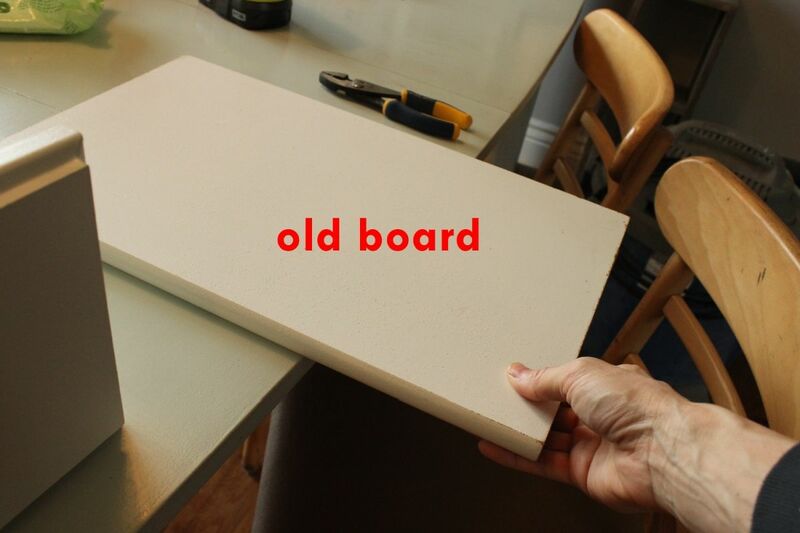 To do this, you’ll be attaching thin MDF panels to the faces of your cabinetry. Measure the faces where it would make sense to attach. 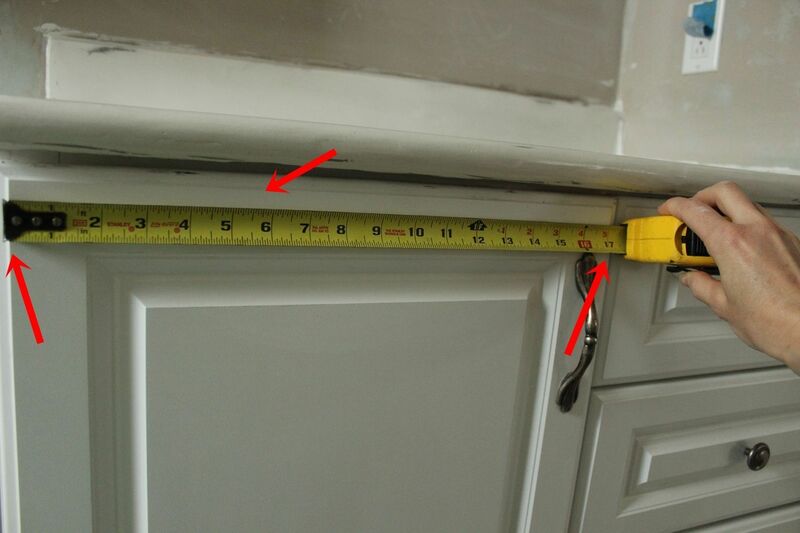 In the case of this example, measurements were taken on the cabinet and drawers right before the edges started rounding. 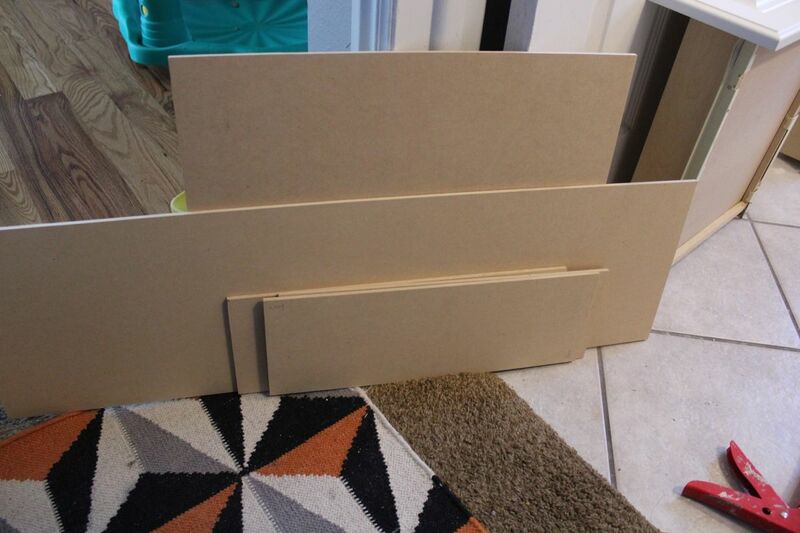 Cut, or have your nice local hardware store employees cut for you, 1/4″ thick MDF boards to match these measurements. 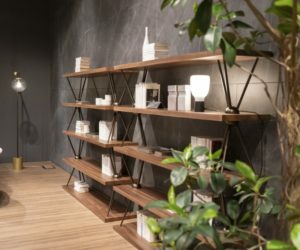 The thickness is up to you, of course, but if your cabinet doors and drawer fronts are already relatively thick, your best bet is to go as thin as possible for the new faces while still providing sufficient sturdiness. 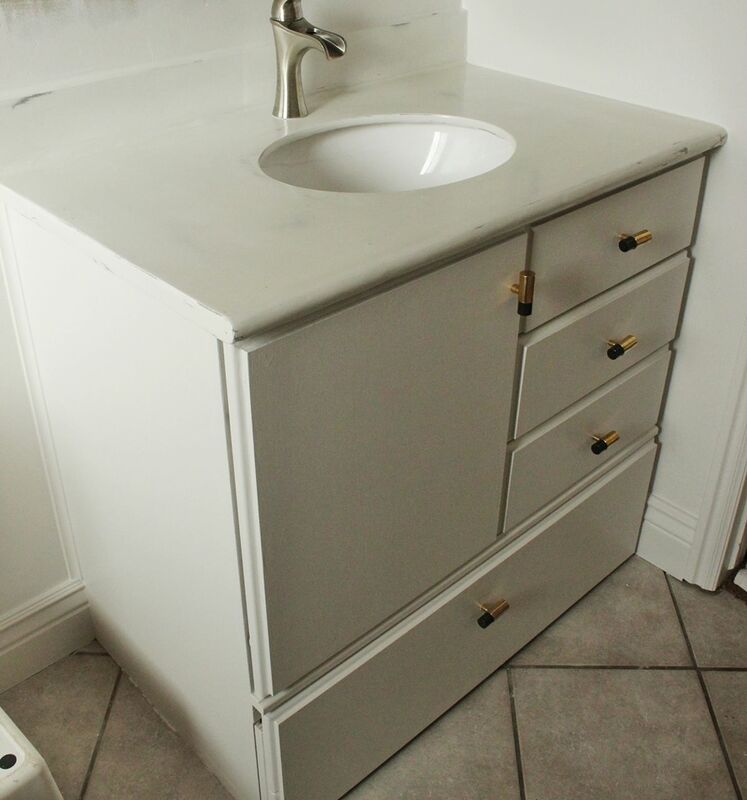 I found 1/4″ to be the best option for this vanity. 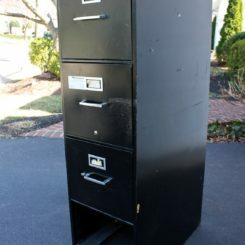 Remove all possible drawers. 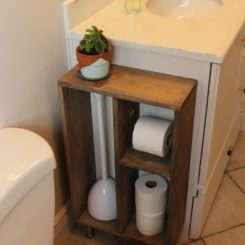 The bottom drawer in this vanity wouldn’t easily come out, so I opted to keep it in. 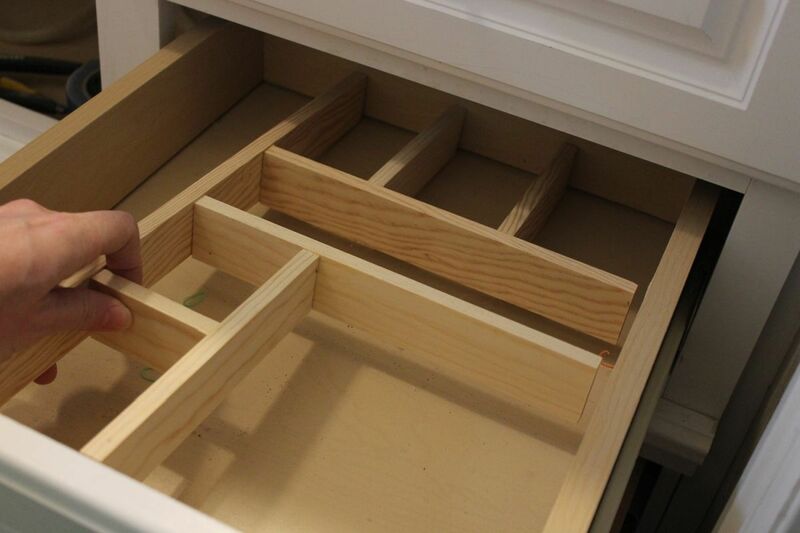 And the top drawer under the sink is a façade drawer face, attached. 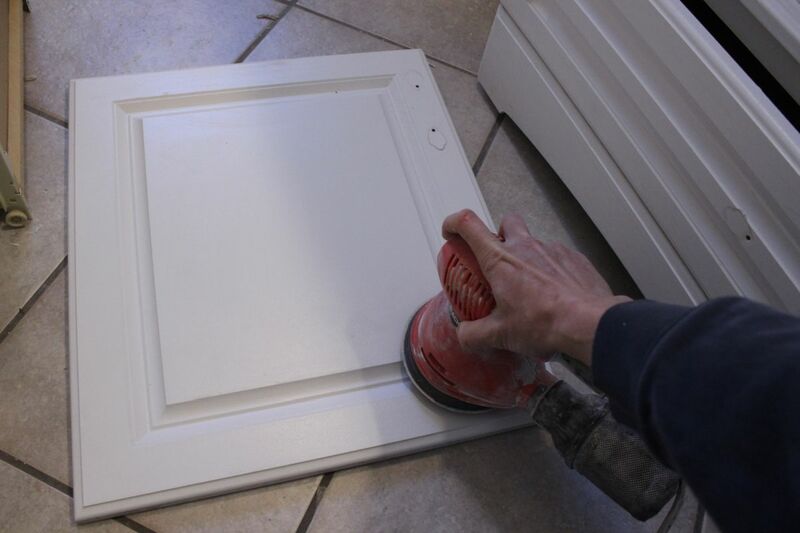 Unscrew the hinges on any cabinet doors, and remove these doors as well. 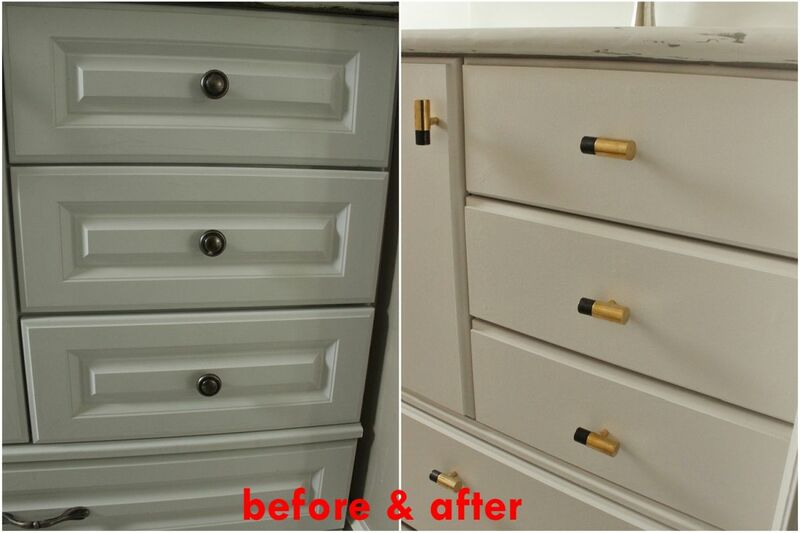 Lightly sand the faces of your vanity doors and drawers to scuff up the laminate a bit. This will help the glue adhere better. 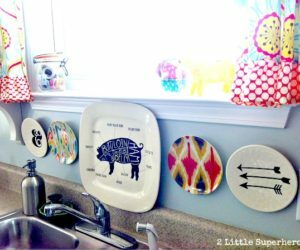 Wipe all surfaces after sanding. 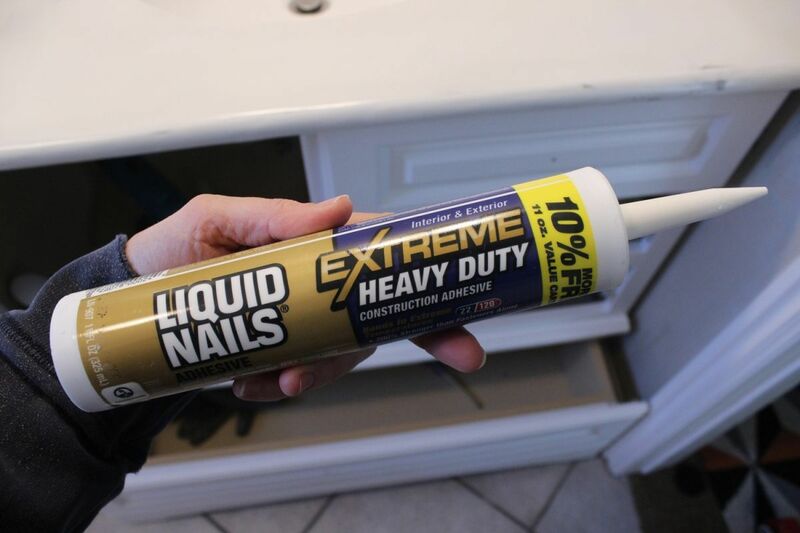 Prepare your heavy duty liquid nails adhesive by cutting off the top and placing into a caulk gun. 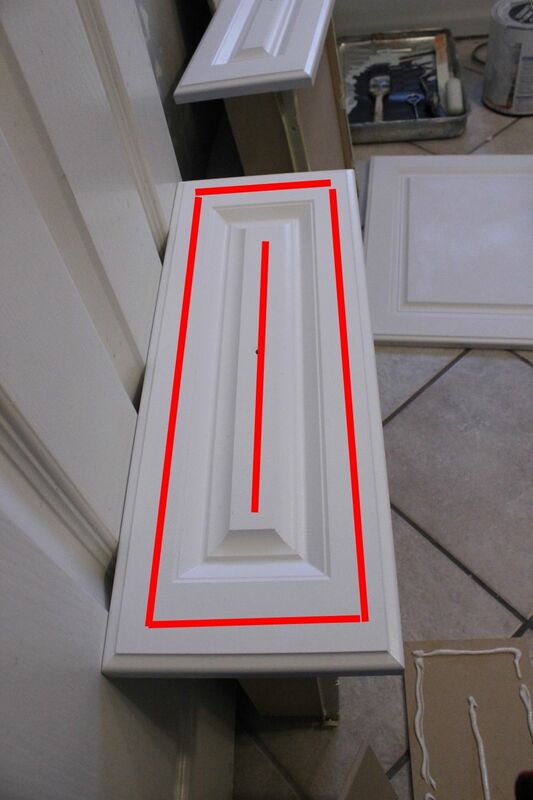 Identify the protruding pattern or layout on your existing door and drawer faces. 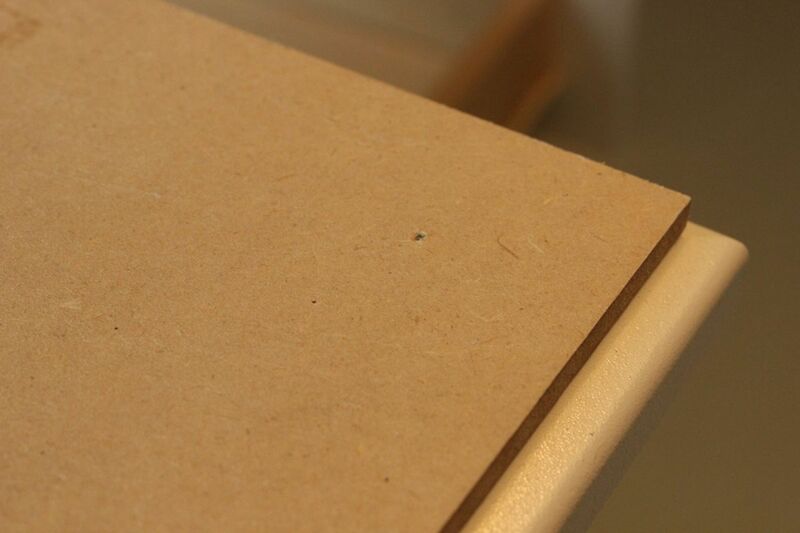 Replicate this pattern, loosely, as you apply your Liquid Nails to the rough side of the MDF board. 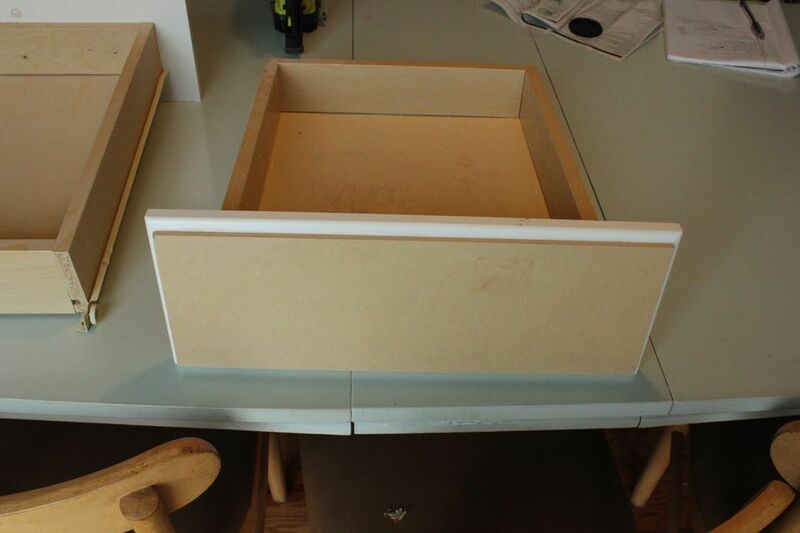 Flip over and attach your MDF board to the drawer face, taking care to align it perfectly all the way around the MDF board. 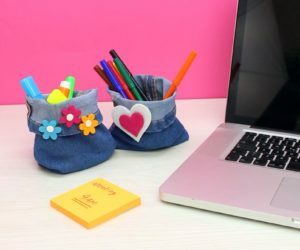 If there are minor imperfections in the sizing, consider the angle that will be least visible (e.g., on the bottom), and let that match-up bear the bulk of the difference. 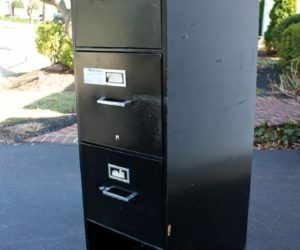 Hopefully, however, your MDF cuts will be close to perfect. 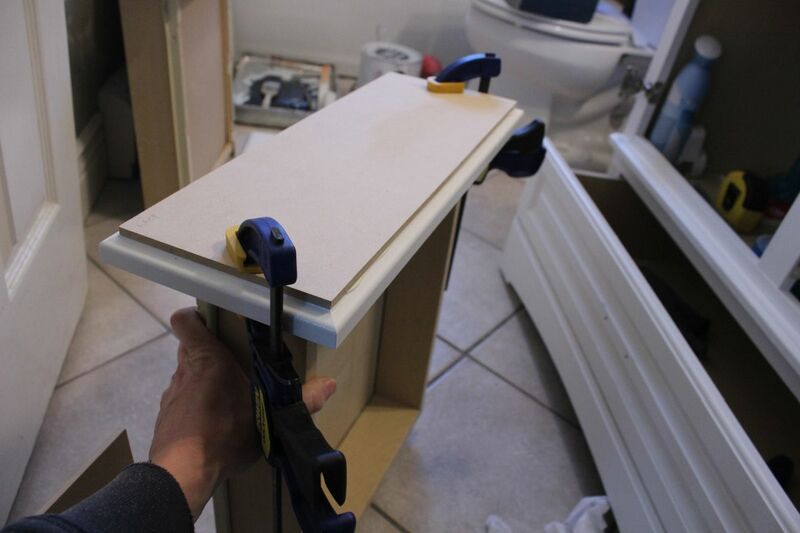 Clamp the MDF board onto the drawer face. Wipe off any excess Liquid Nails that escapes. 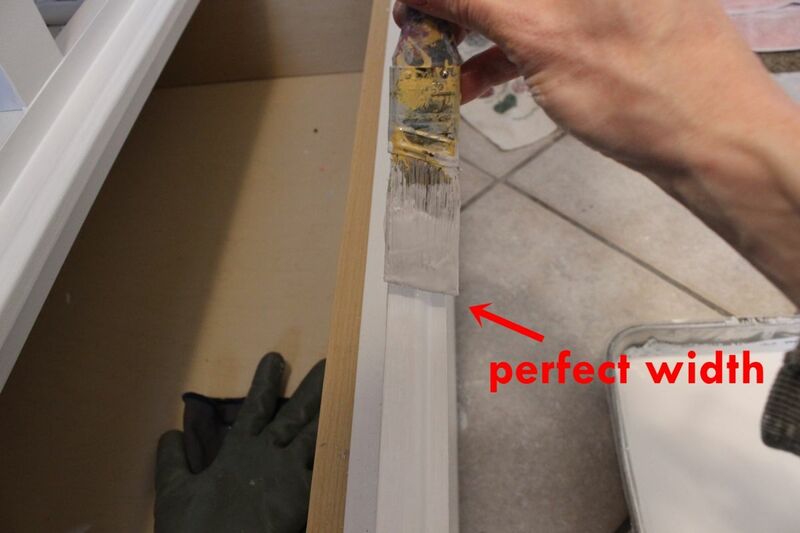 You’ll be caulking the seam, but you want it as smooth as possible to begin with. Continue this process on all the faces. 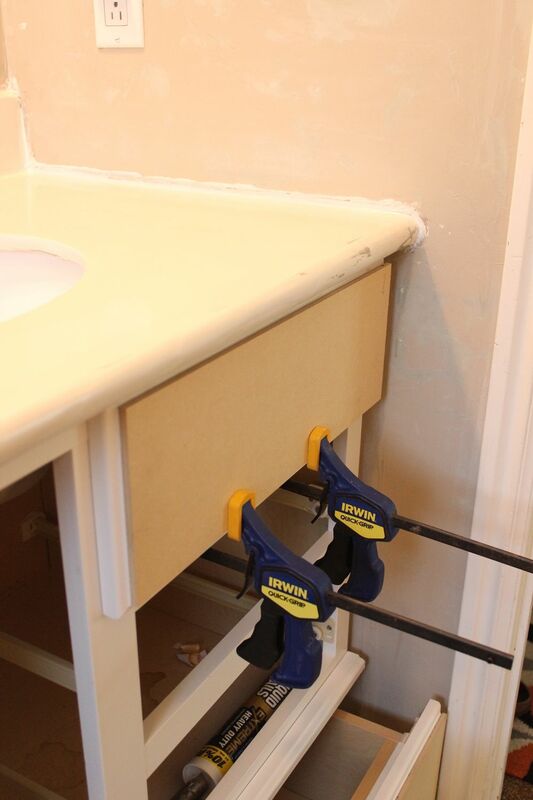 Clamping is particularly critical for any faces glued on vertically. 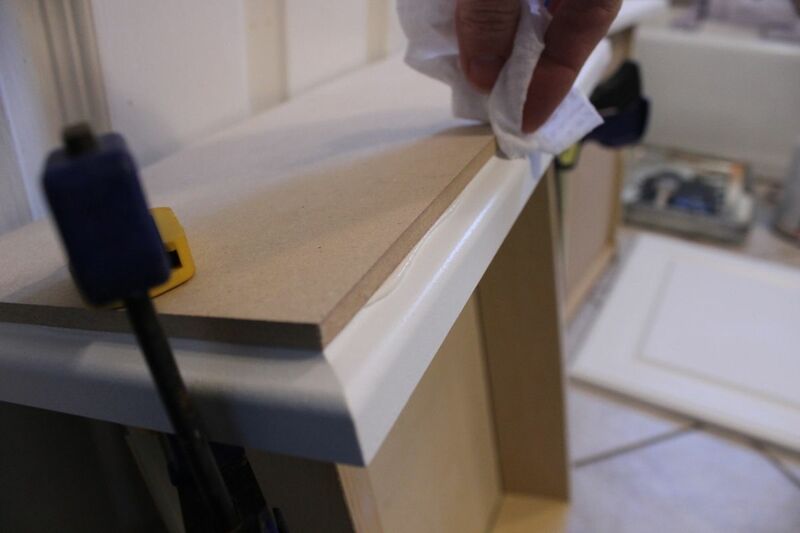 You will be using a brad nailer to secure the MDF to the faces in a bit, but I found keeping things in place and squeezing out any excess adhesive in these first few minutes to be important. 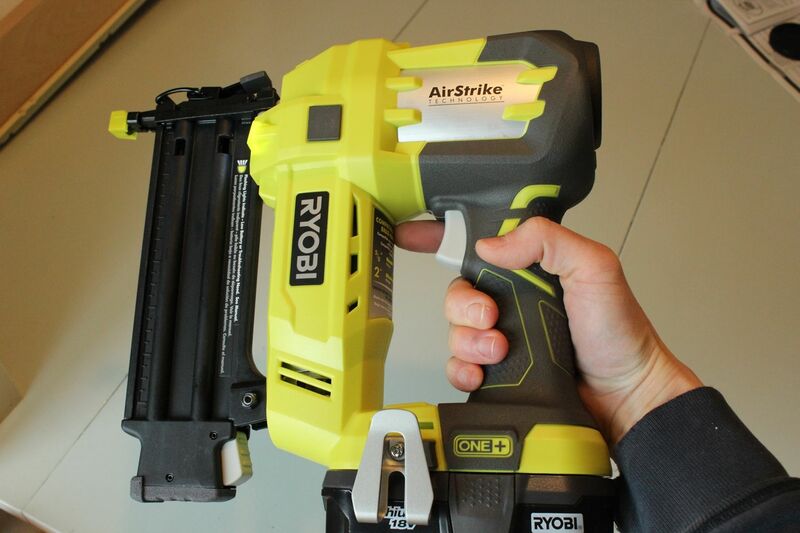 Test the nailer out on a scrap piece of MDF to set the force and depth of the nailing mechanism. 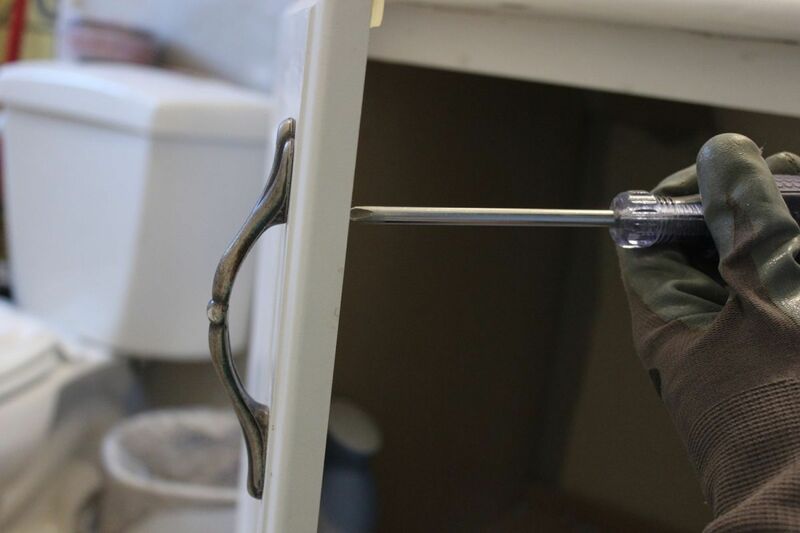 After you’ve set the nail force to your satisfaction (you don’t want the nail above the surface of your MDF, but you don’t want it buried deep down, either), begin nailing the MDF facades to the drawers and doors. This nail was a little on the deep side and called for a minor pressure adjustment. 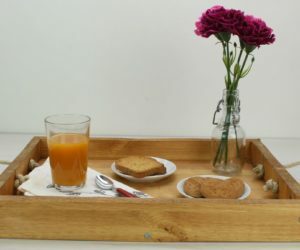 Take care, when you’re nailing the MDF onto your doors and drawers, that you follow the footrpint of the protruding pattern on your original door and drawer faces – in other words, nail down in the same places that you used Liquid Nails. This will ensure maximum connection. 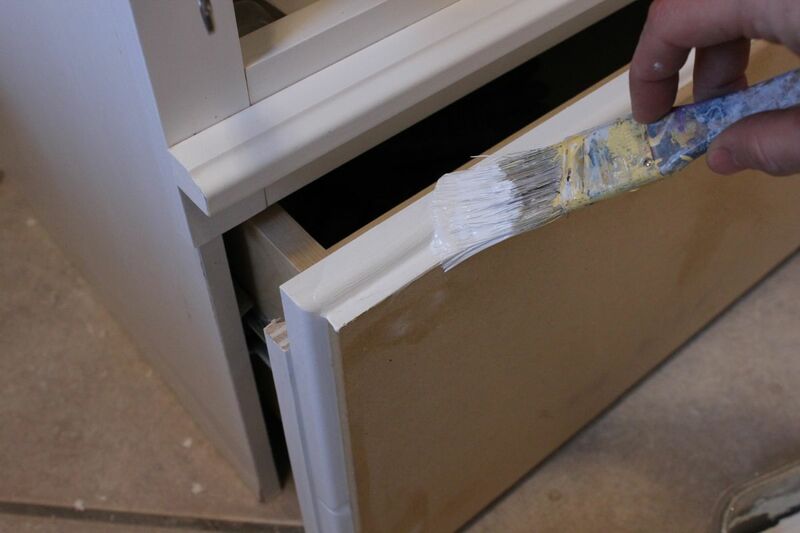 After your door and drawer faces are glued and nailed down, it’s time to caulk. 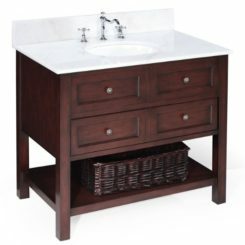 This will provide a seamless look to your vanity and make it seem like the doors and drawers were built this way. 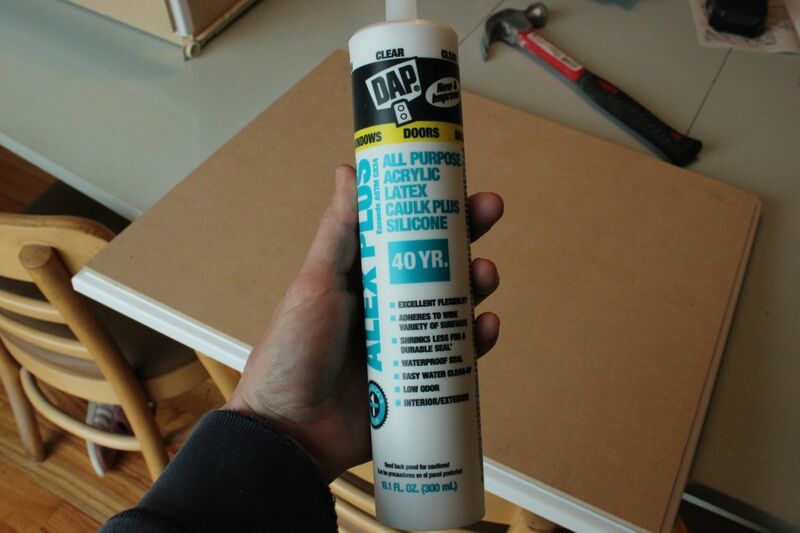 All-purpose caulk is fine here. I admit to being less than a caulking expert here, but the general idea is to run a bead of caulk down the space to be caulked. 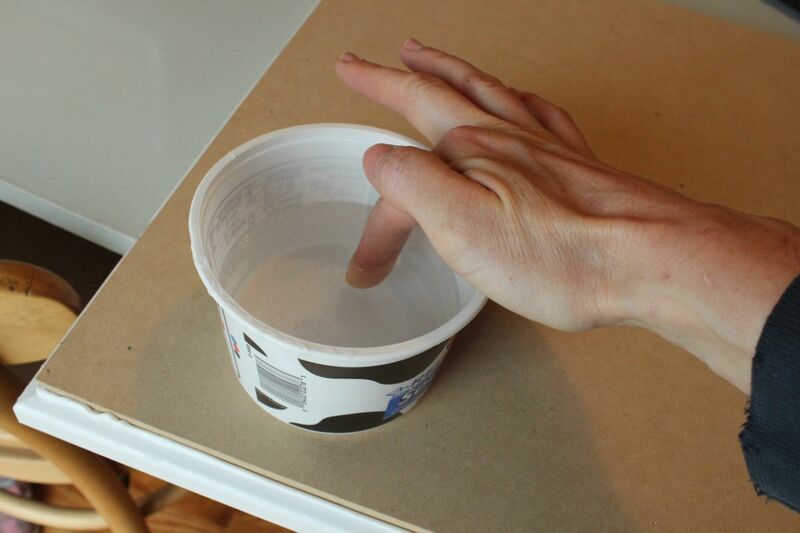 Dip your finger in water to moisten it. 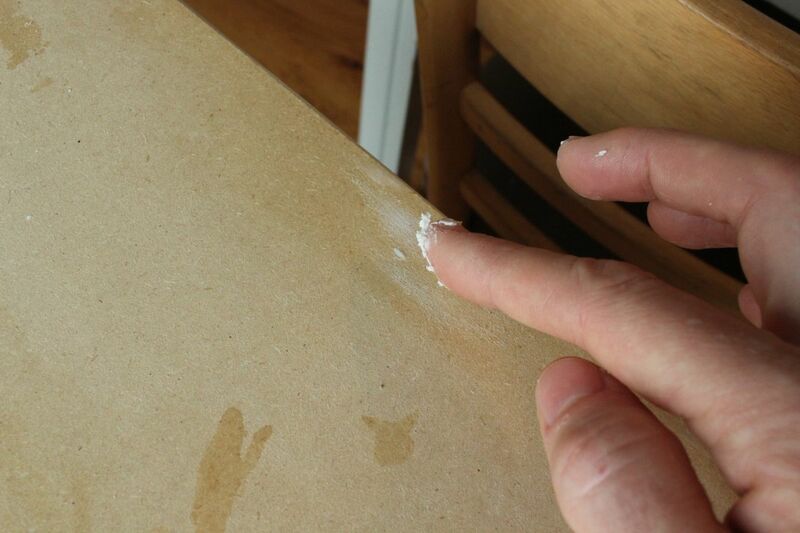 Smooth out the bead of caulk with your moistened finger. 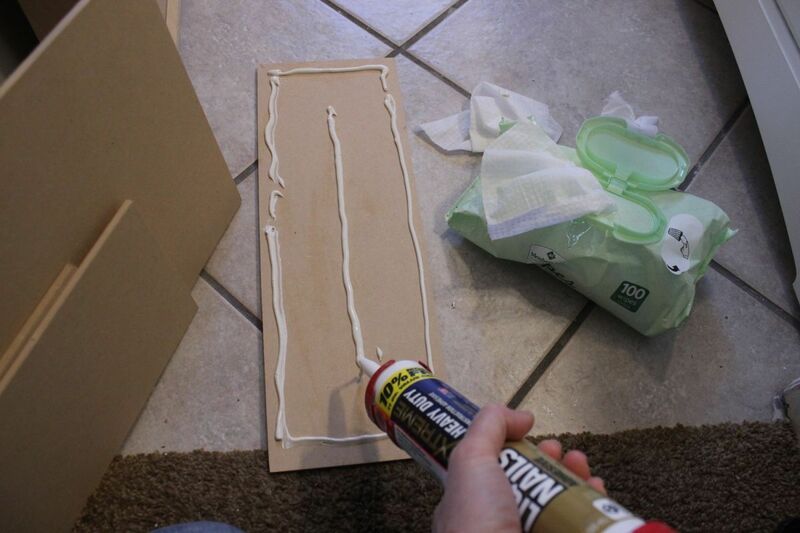 Make as few passes down a single line of caulk as possible. 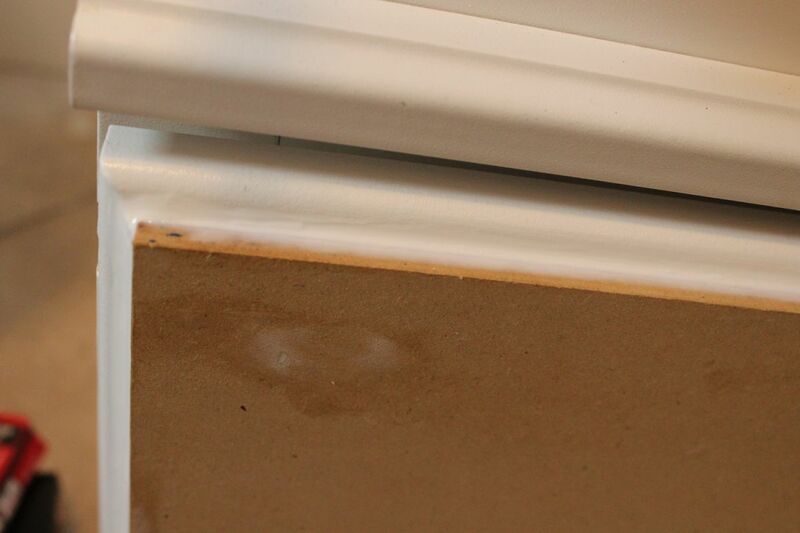 Avoid the temptation to go back and “fix” areas whenever possible, as this often makes the area look worse when the caulk gets tampered with. 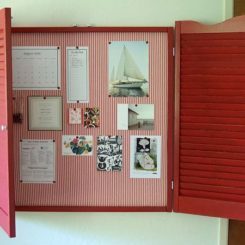 Do this to all four sides of each door and drawer where the MDF board meets the original face. 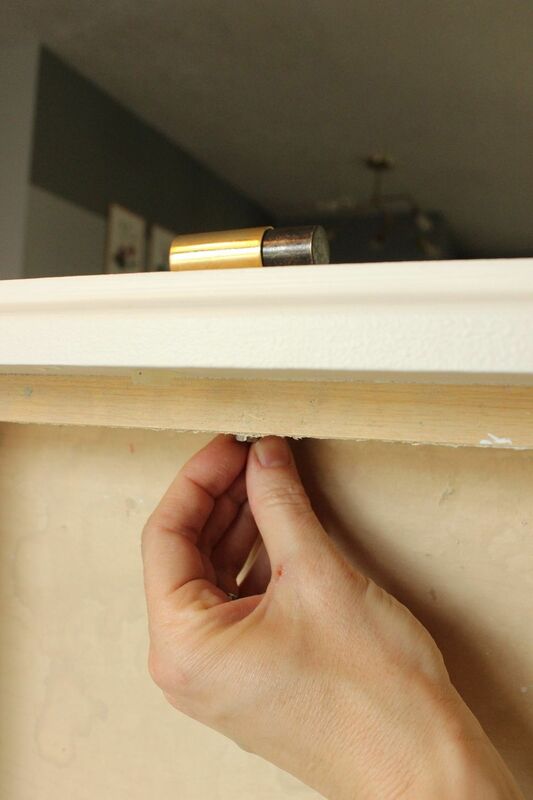 While the caulk is drying, you can fill the nail holes with spackle. 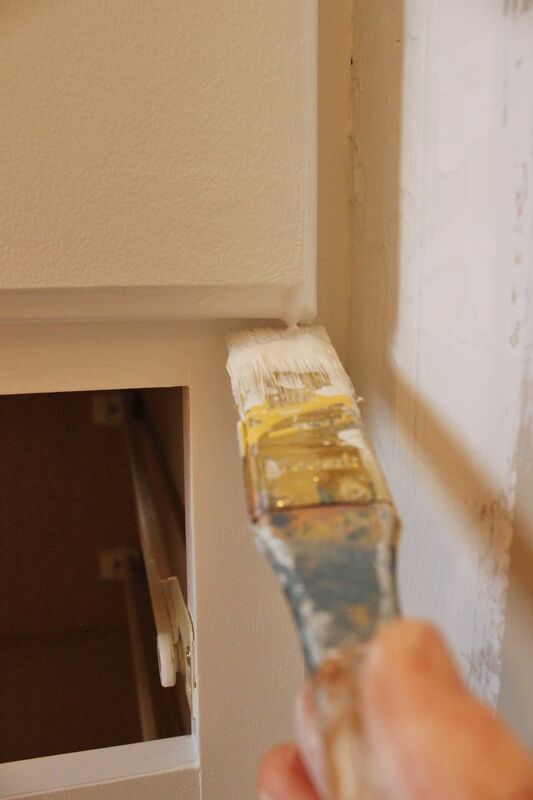 Fill the holes and smooth out the surrounding spackle, if there is any, to decrease the need for sanding before priming and painting. 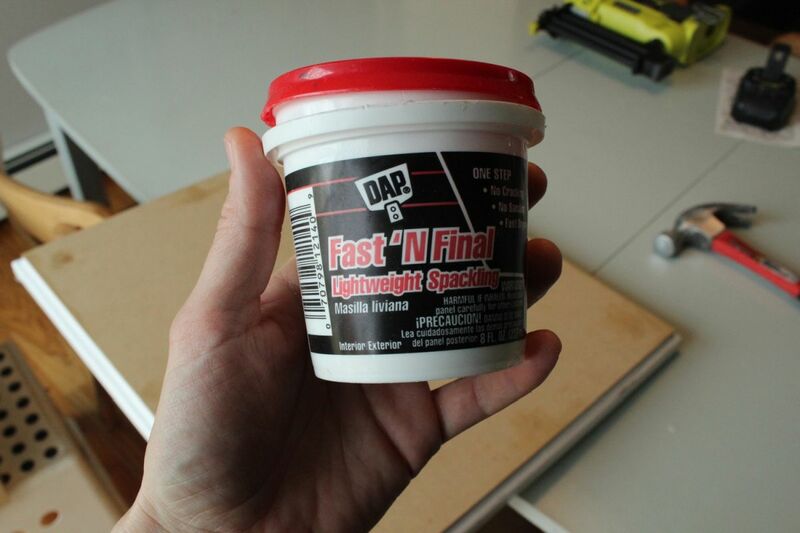 When caulk and spackle are completely dry, it’s time to prime. I apologize for the nonexistence of a legible primer can; this shows, however, just how much this primer is used around here. 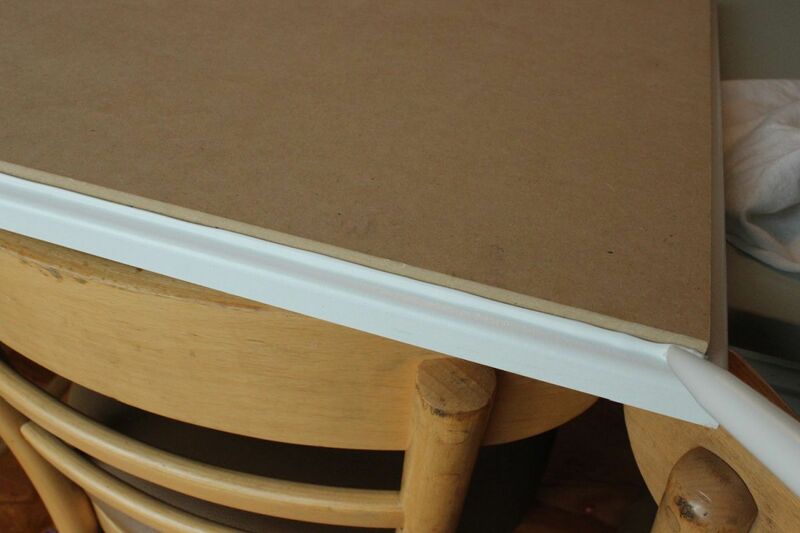 It’s Zinsser’s Bullseye 1-2-3 water-based primer (blue label), and it’s an awesome primer for use on laminate furniture. Begin priming your pieces. I recommend doing the angled and non-flat edges first. 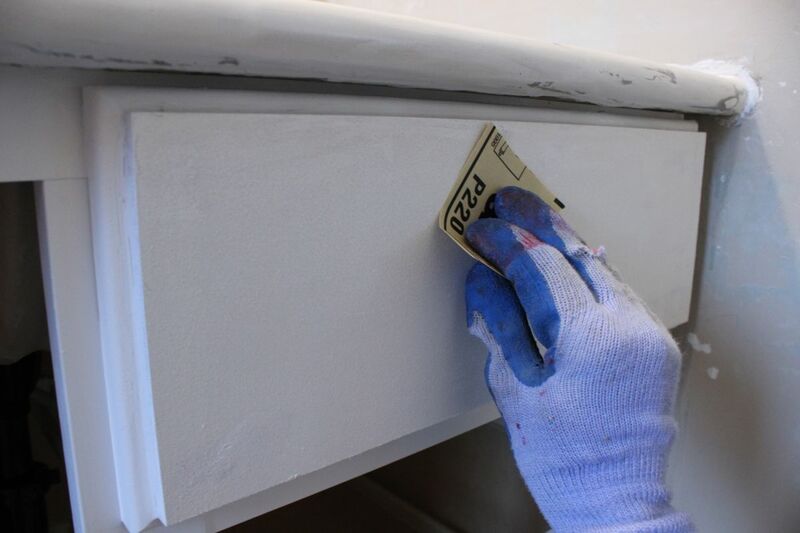 When the sides and edges are primed, use a foam roller designed specifically for doors and cabinets to coat the MDF faces with primer. 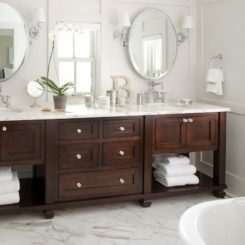 Prime not just the drawers and doors that you’ve just re-faced, but also the entire vanity exterior surfaces. 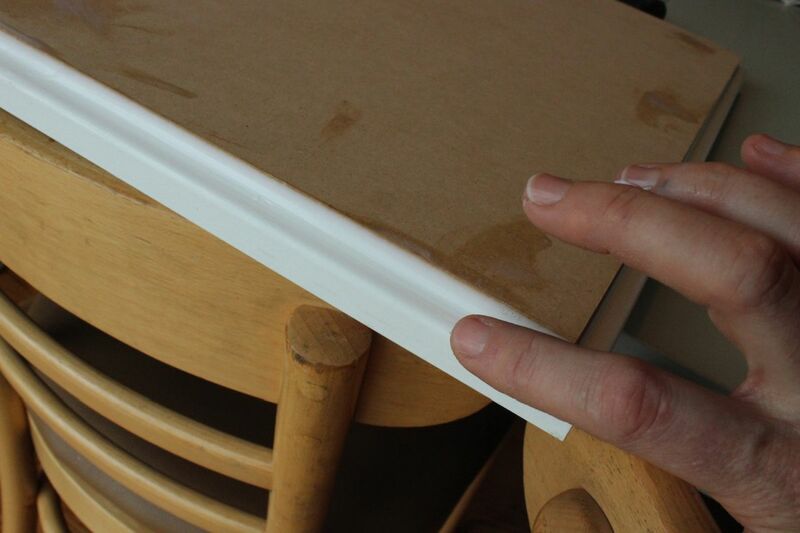 After the primer has been applied and dried, it’s a good idea to do a quick sanding to smooth out any imperfections. 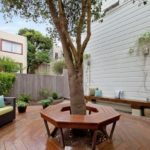 This is particularly important since you’ve just primed your first coat, and any bumps and drips at this point will only be built upon as you add more coats of primer and paint. 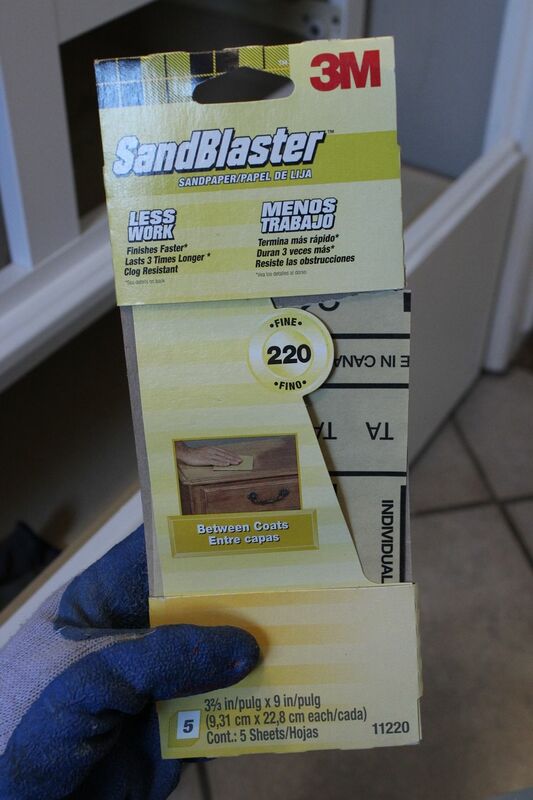 Grab some fine-grade sandpaper (recommend 220-grit). Lightly sand all primed surfaces. Wipe them down, then prime a second coat. 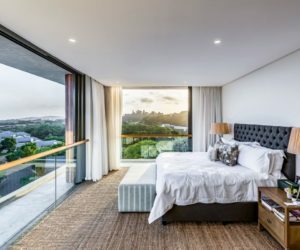 You might be tempted to skip this step, but don’t do it. 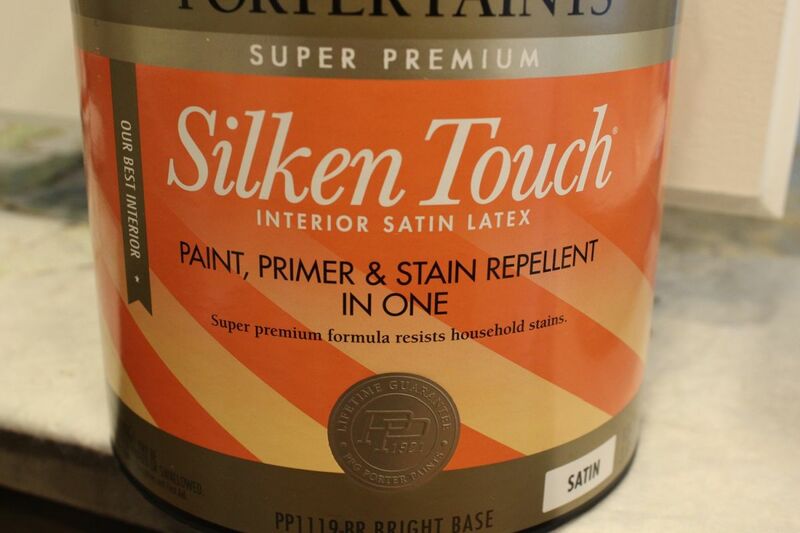 This second coat is particularly important for laminate pieces, as the primer provides the critical paint-to-laminate bond. 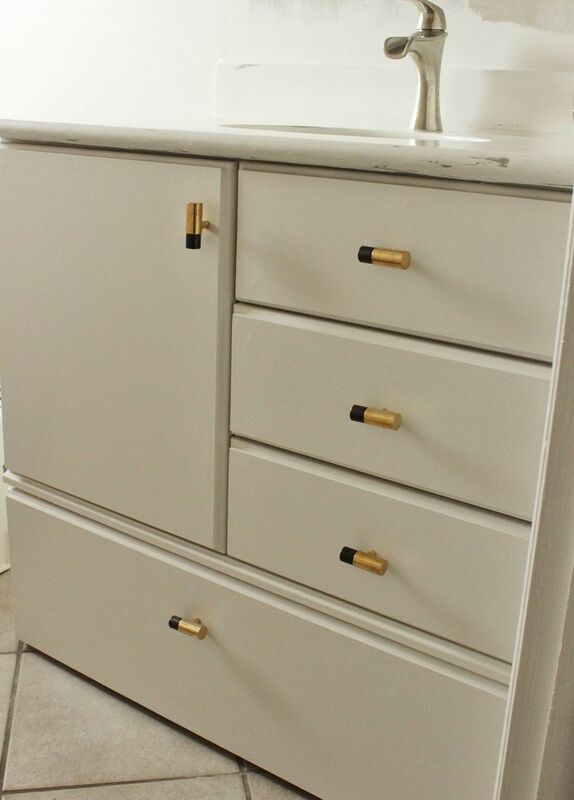 After your doors, drawers, and vanity exterior have all been primed, it’s time to paint. 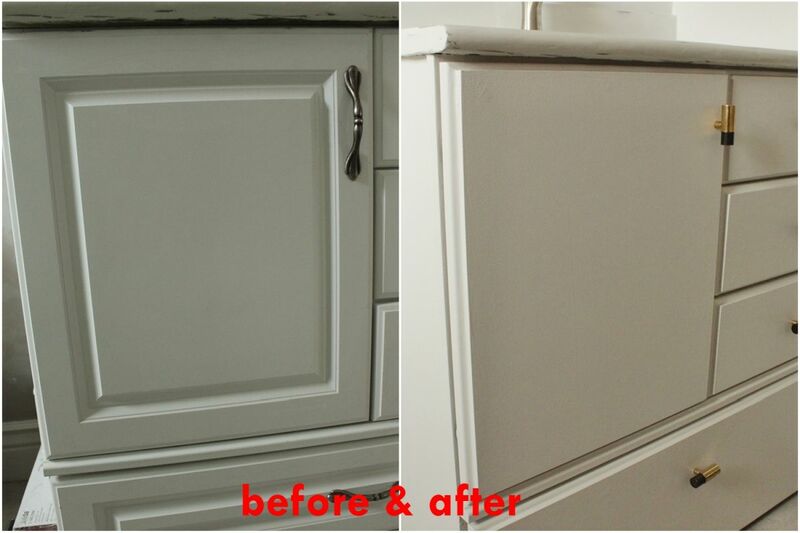 This example uses satin finish, high quality paint, tinted to Farrow & Ball’s Strong White. 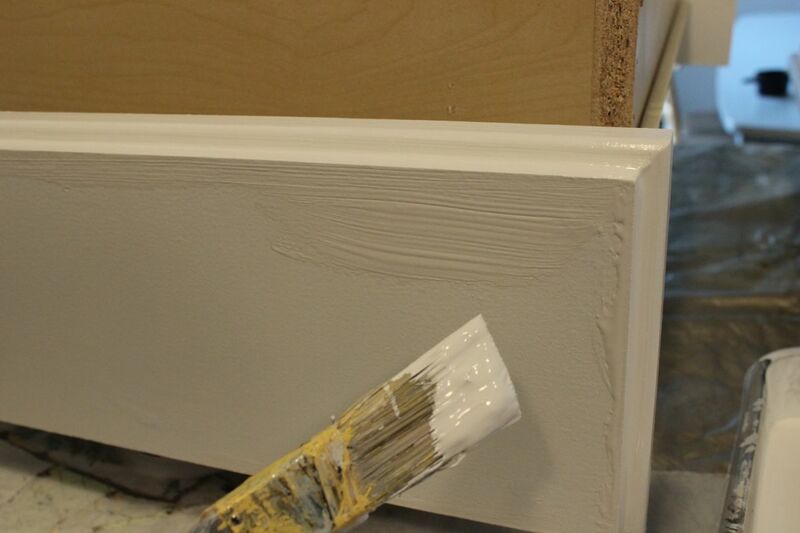 Following the pattern of applying primer, you’ll want to paint the edges and ridges first. Brush strokes are hard to avoid on a super-flat drawer face. This is why a foam roller is ideal for a smooth, seamless finish. Roll over everywhere you can to avoid brush strokes. 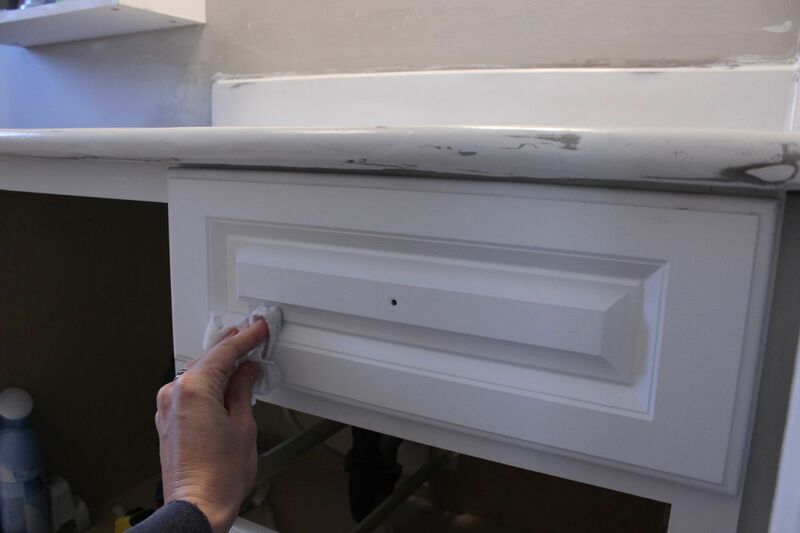 When you begin to paint the vanity itself, one tip is to start at the furthest back surface and paint forward. 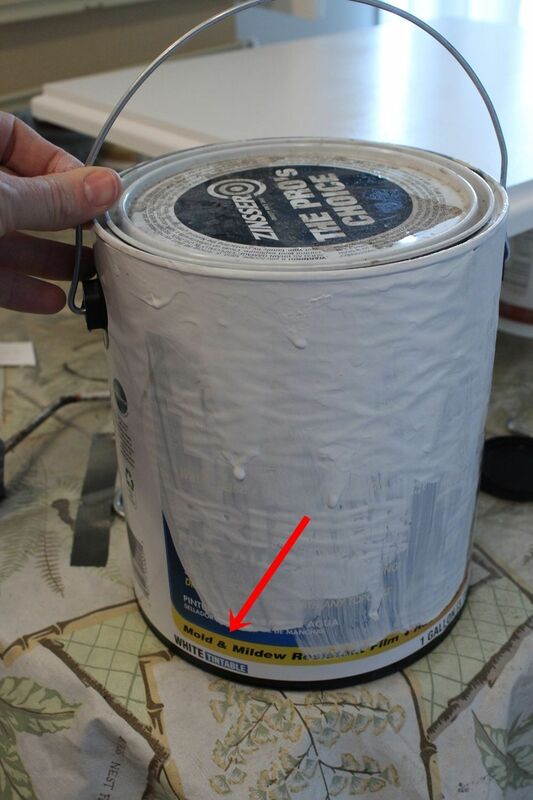 This decreases the opportunity of leaning over your wet painted surface to reach a point further back. 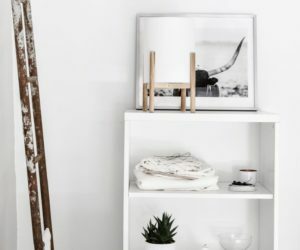 Another basic painting tip, when painting furniture with ridges and angles, is to choose the size of brush that most closely matches the surfaces you’ll be painting. 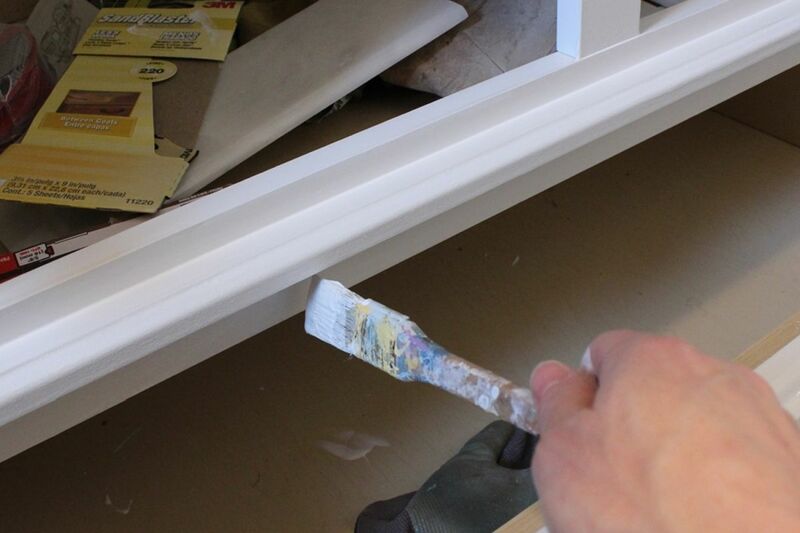 A brush that’s too wide for the sides of a drawer face, for example, only leads to excess paint that will drip or run. 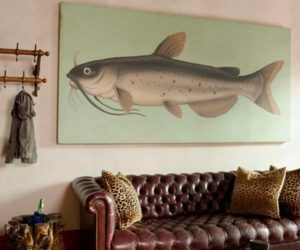 A better alternative is to, whenever possible, opt for a brush that closely matches the paintable surface. 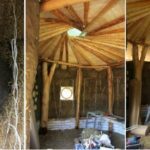 This keeps most of the paint contained on the surface to be painted and, as a result, provides a more efficient painting method. 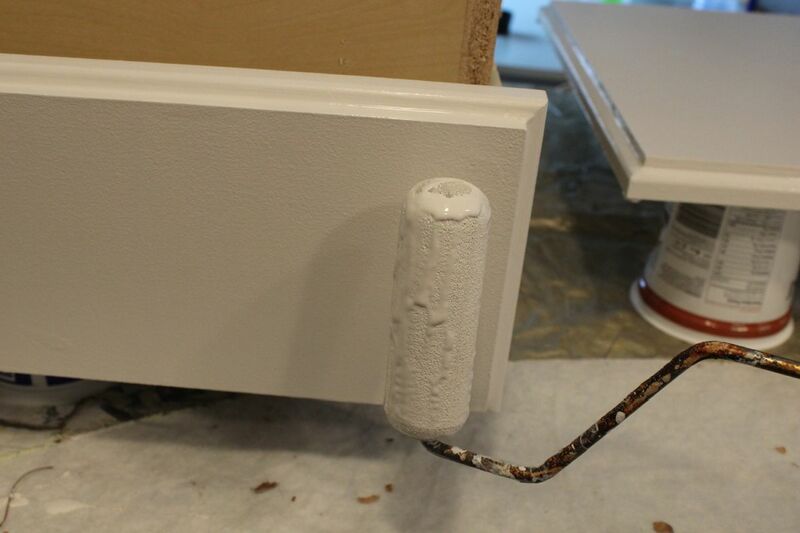 Use the foam roller on vanity sides as well as the door and drawer faces for the smoothest paint coat possible. 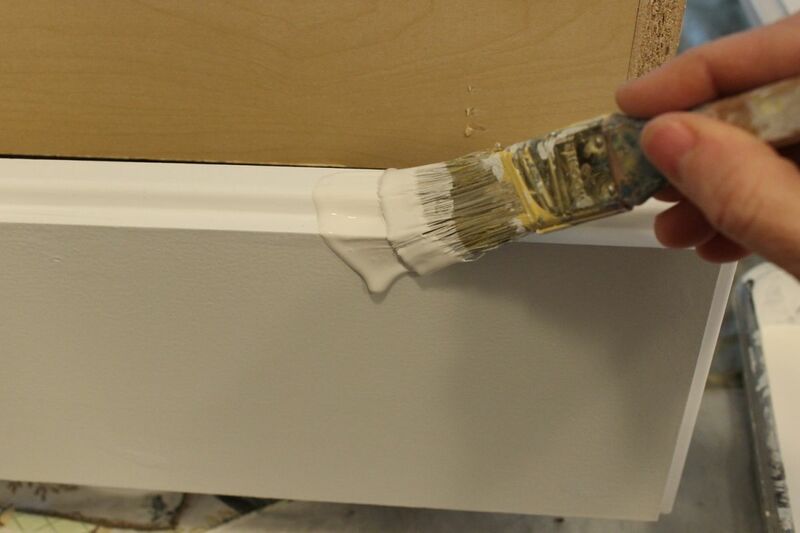 After painting a section, go back in a few minutes and check for any drips. These are easiest and most effective to get rid of within five minutes, while they’re still wet. Wipe them away with the tip of your paintbrush. Let your paint dry. Gently sand with fine sandpaper. 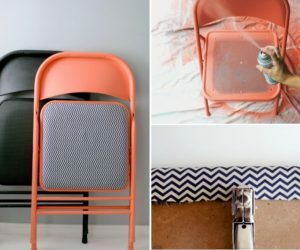 Apply one or two more coats, letting them dry thoroughly and sanding between each coat. It’s looking good, nice and fresh. 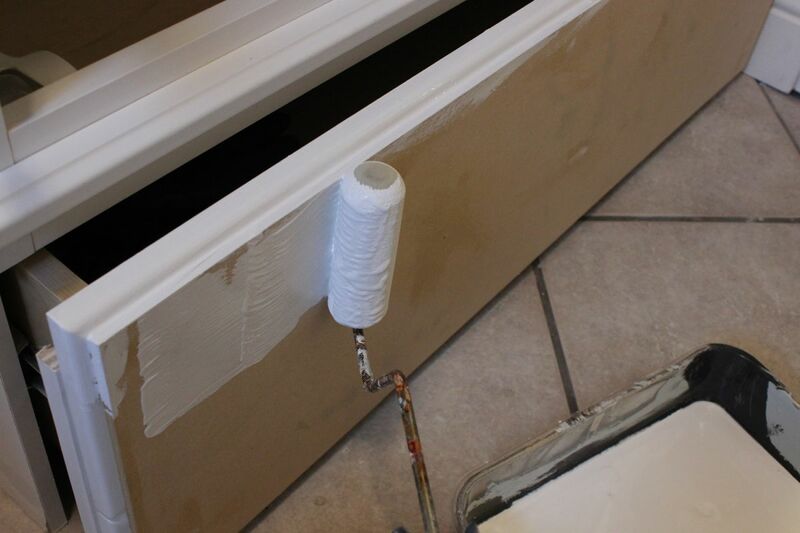 When your paint is dry, it’s time to install your new and improved hardware. 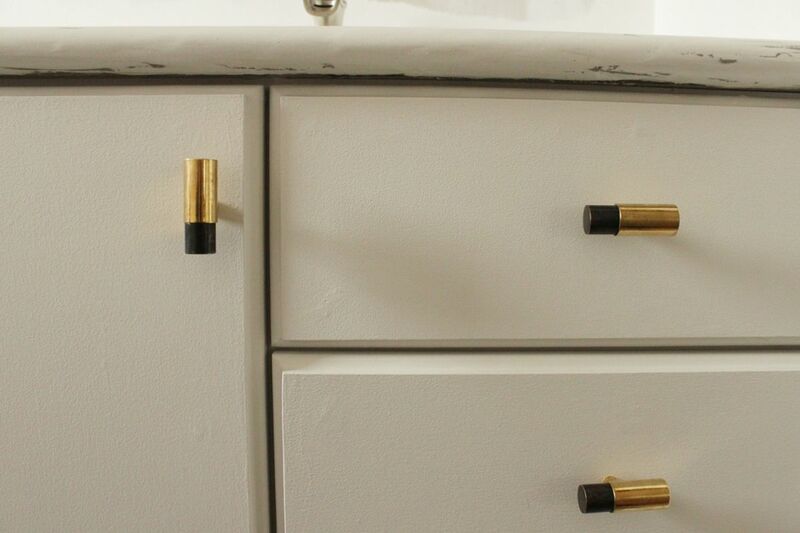 These T knobs from Anthropologie have the perfect blend of vintage charm and modern simplicity for this bathroom’s style. 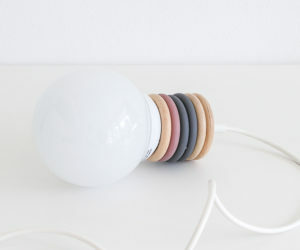 Make sure, as you are selecting your knobs, that the thread posts are long enough to go through your added MDF façade. 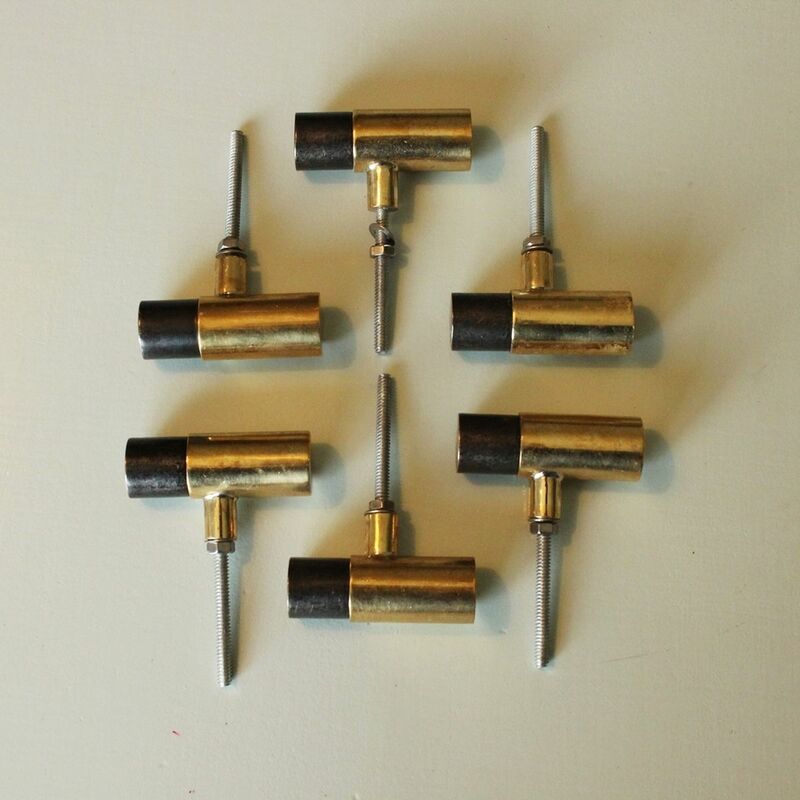 Find the drill bit that most closely matches the knobs’ threads. I do this by holding up both the threads and the drill bit and eyeing them from the bottom, looking only at the circle sizes to compare. 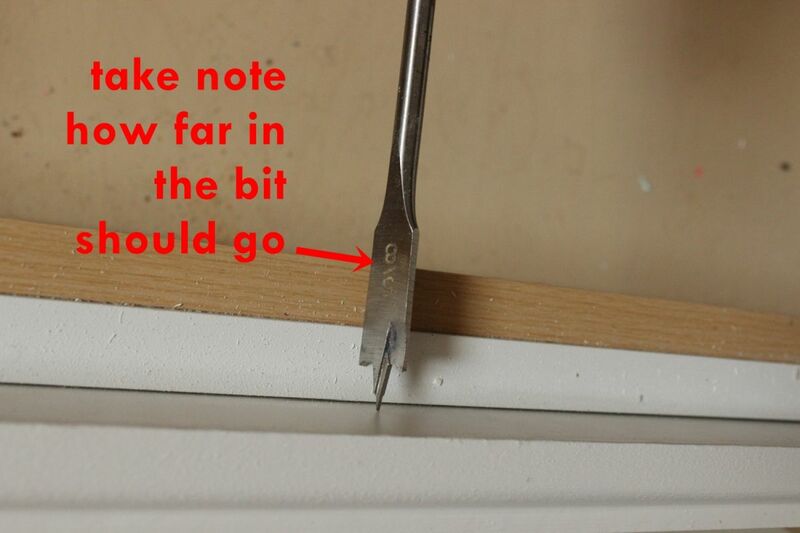 The following is an example of how NOT to drill a hole through MDF, although many people do it this way without knowing any better. (Don’t worry; I will give you the easy solution to this poor methodology shortly. 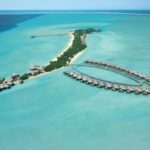 You’ll be amazed at the difference a simple strategy makes.) 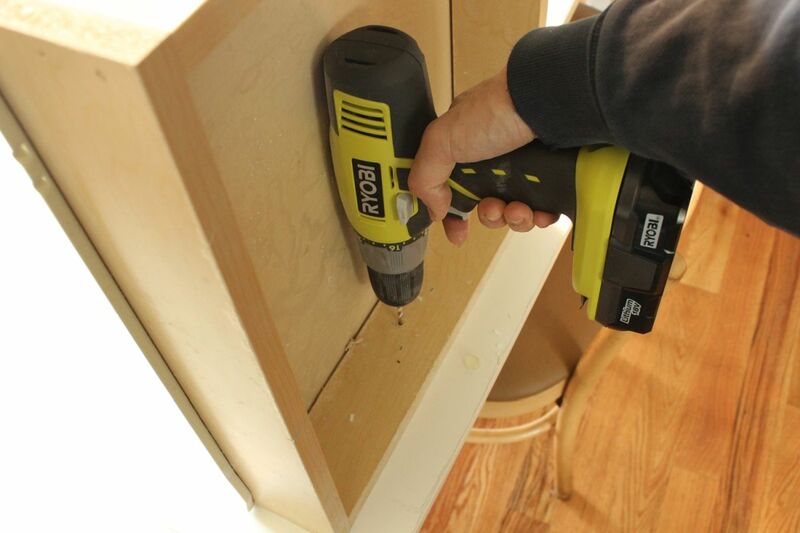 In this method, you’ll line up your door or drawer to be drilled with the edge of a sturdy surface, such as a table, so that the drill hole is just off the table. 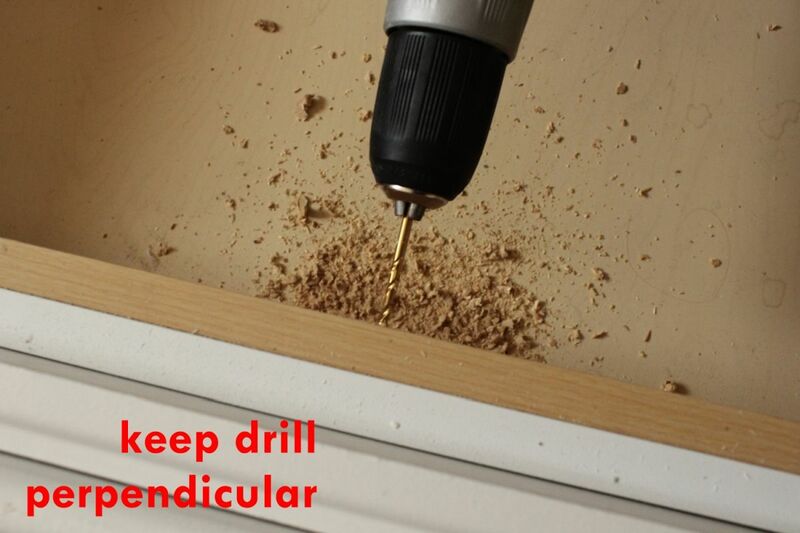 Keeping your drill bit perpendicular, drill straight through the existing hole, into and through your MDF. 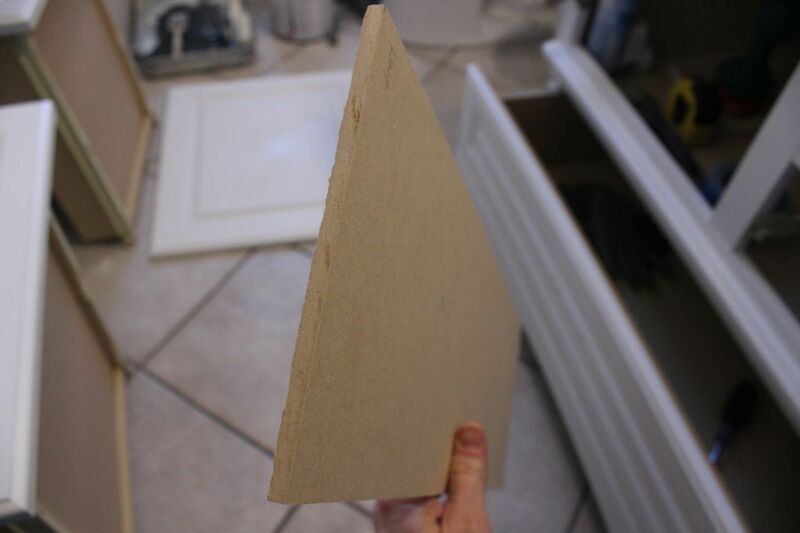 The goal is to create a hole in the exact center of your MDF face, using the old center hole as your guide. 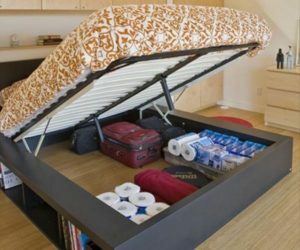 When you flip your drawer or door over, however, you’ll likely see a worrisome sight. 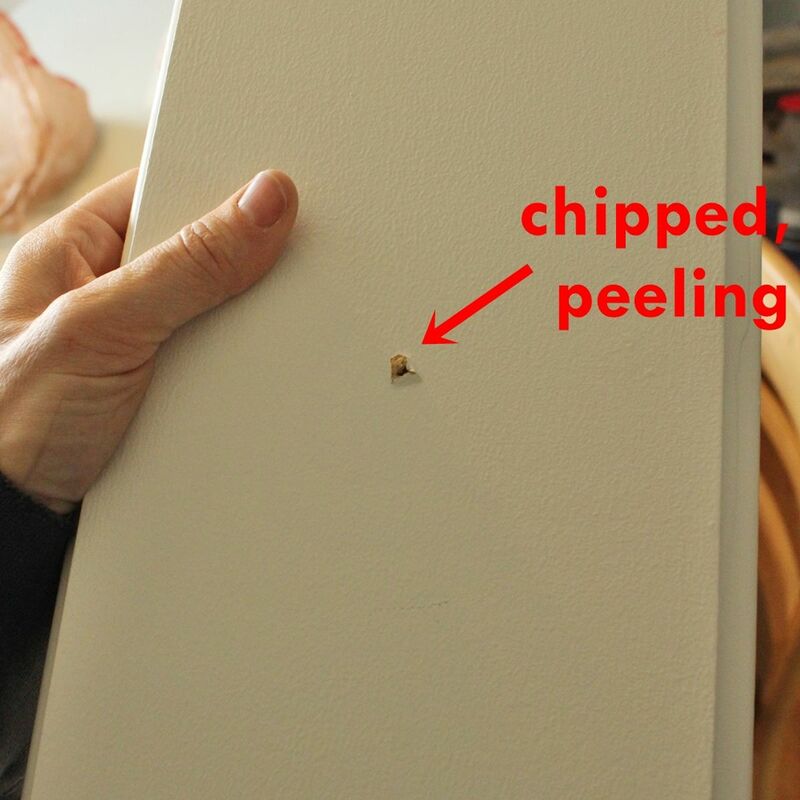 A chipped, peeling, or otherwise damaged drill hole might greet you. This is a problem, after you’ve worked so hard to create a smooth, flat face. 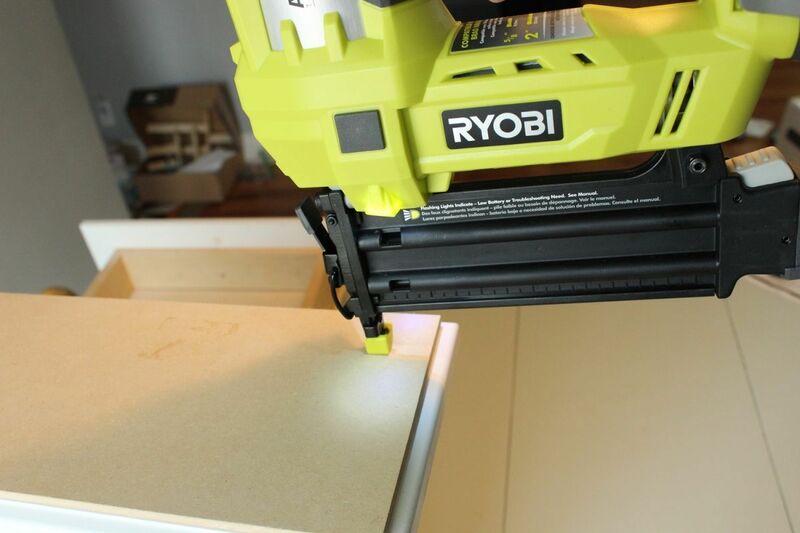 MDF is particularly prone to chunking out like this when drilling. 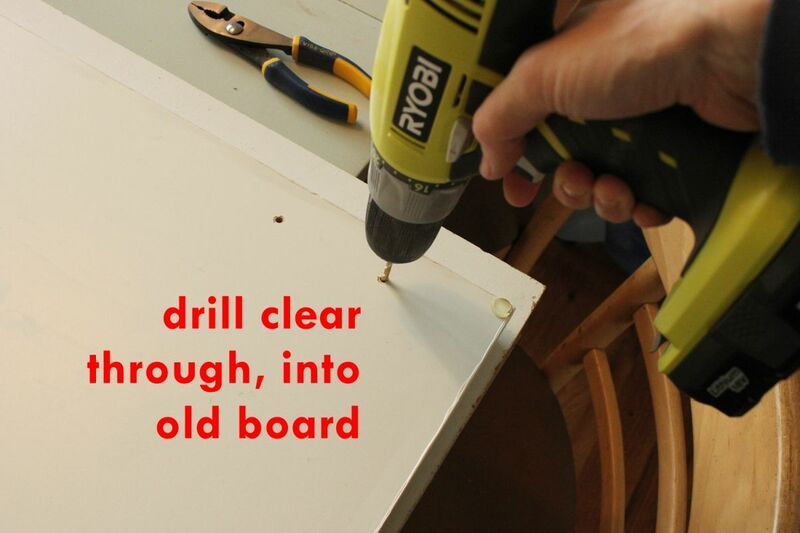 The strategy for drilling clean holes, every time, is as follows: Gather an old board that you don’t mind getting drill holes in. 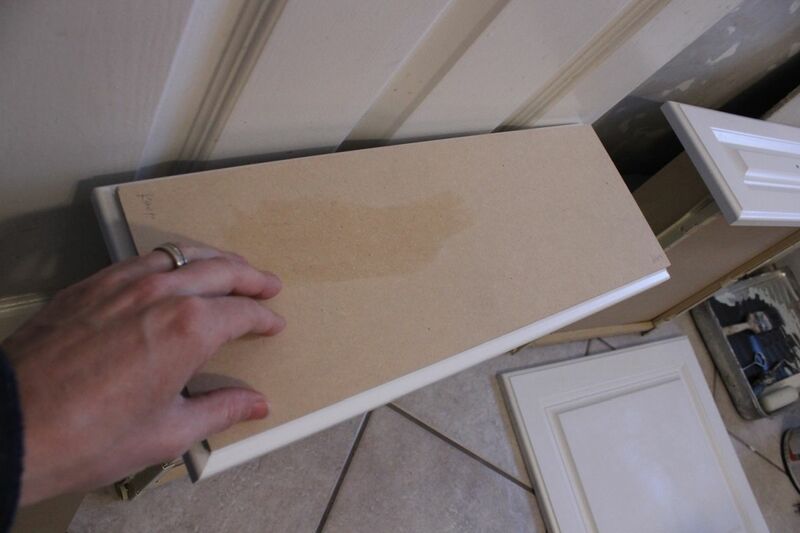 Lay it on the surface you’re using for supporting your door/drawer while drilling (e.g., table). Place the piece to be drilled face-down on top of the old board. 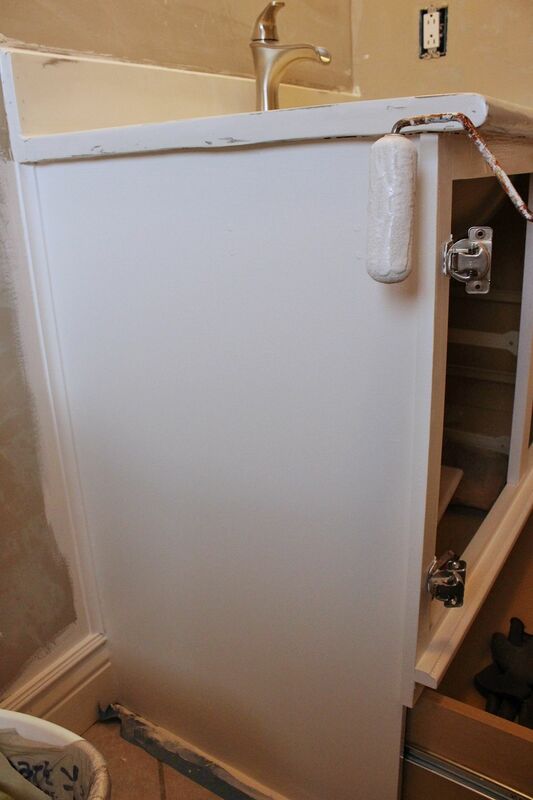 In this case, I’ve laid the cabinet door on the old board in preparation for drilling into just the top hole. 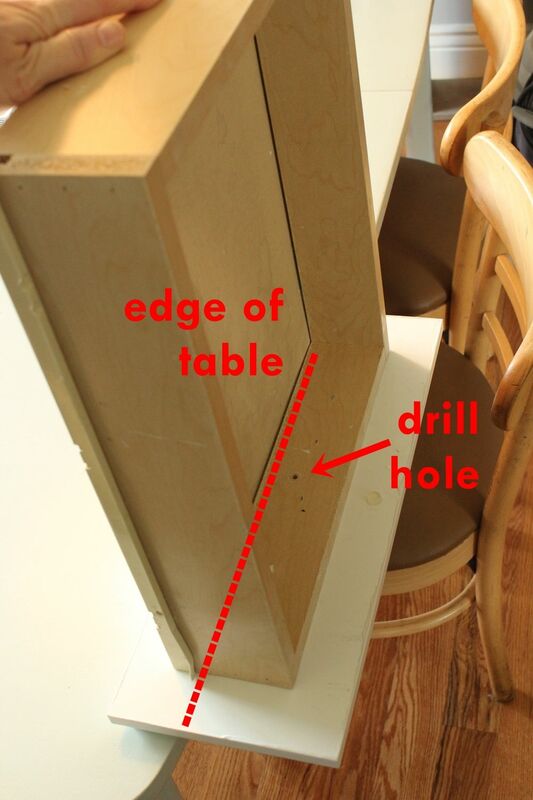 Make sure the hole to be drilled is above air, not above the table surface itself. 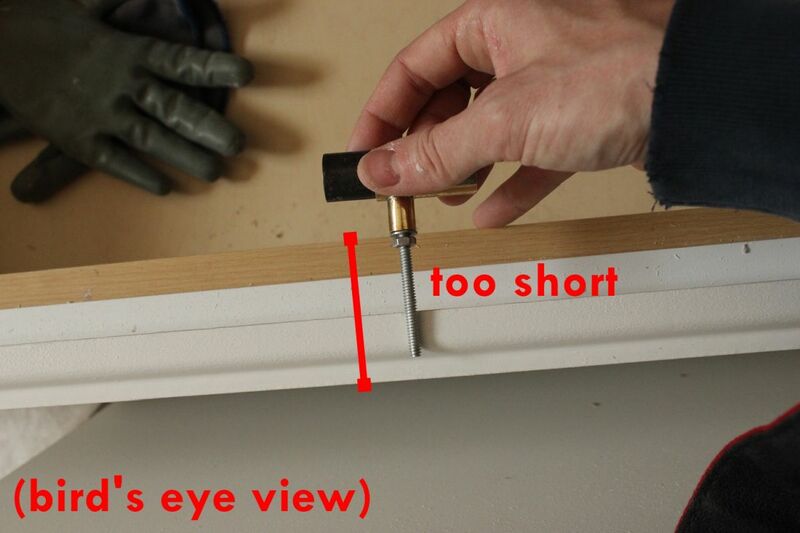 Again, using the existing hardware hole(s) as your guide, drill straight through the hole, through the MDF, and just into the old board. 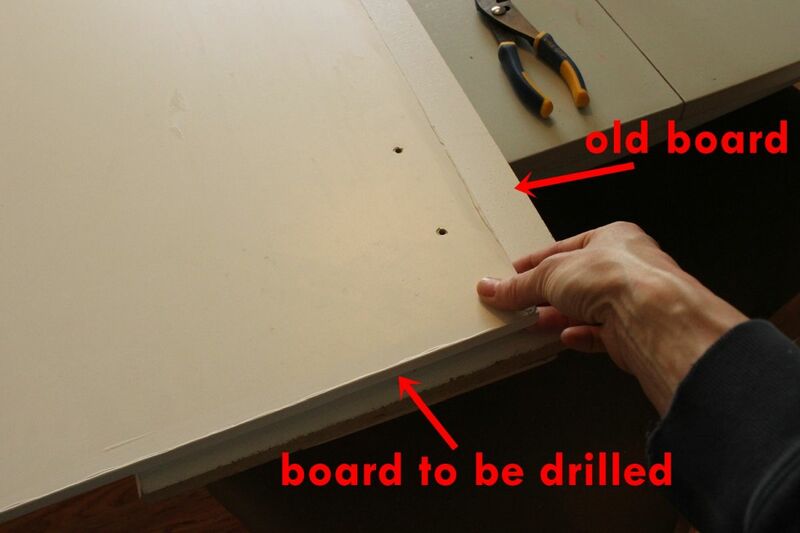 While you’re drilling, you want to hold the old board tight against the cabinet face so there’s no space between them. Pretend they’re just one piece. 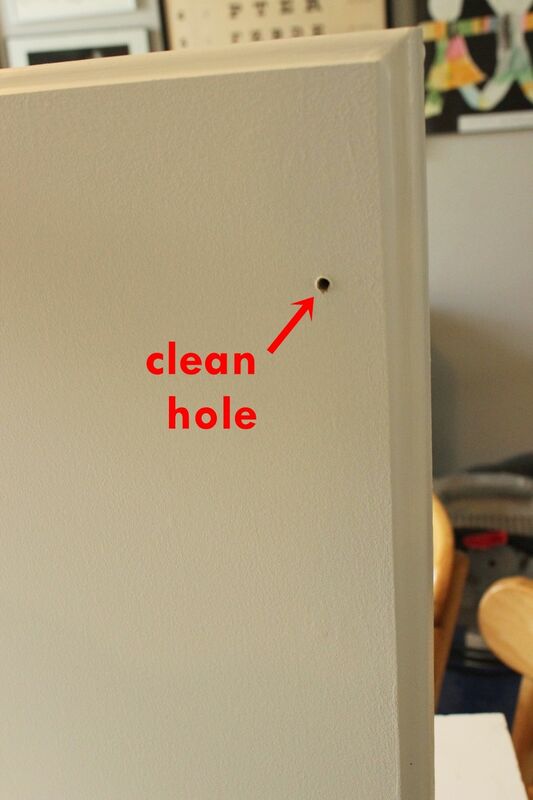 When you remove the drill bit and flip over your cabinet door, you’ll see that the hole drilled is clean-edged and perfect. 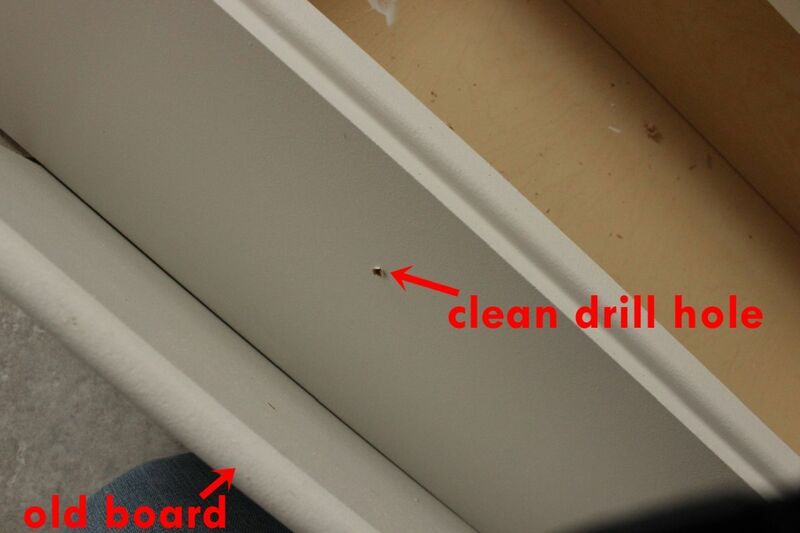 This is because, as the drill pushed through the MDF, the MDF surrounding the drill bit had nowhere to “go” because the old board was there, pushing back. 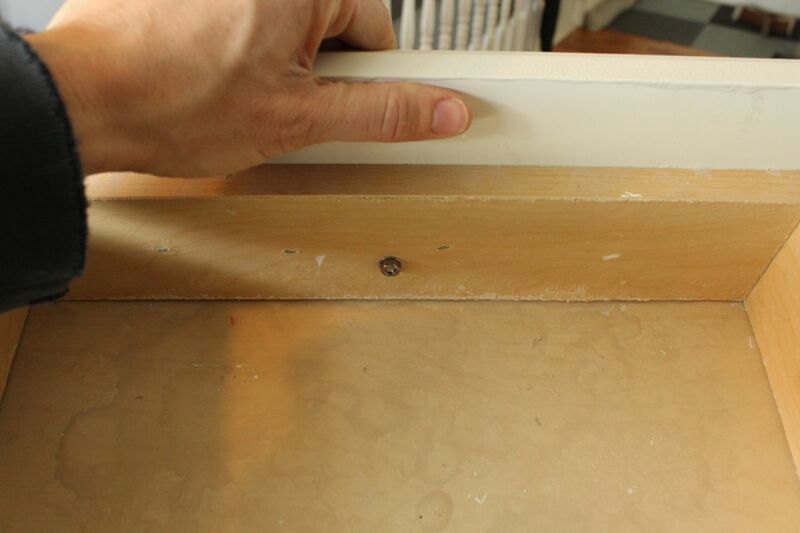 This method works every time for a clean drilled hole on both the back and front ends. Screw your new hardware into the drilled holes. 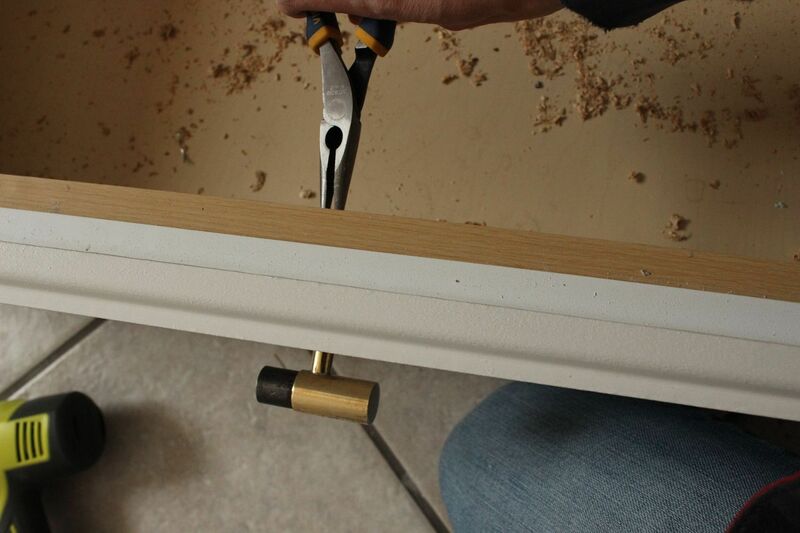 Attach the nut to the threads on the inside of the drawer and tighten. 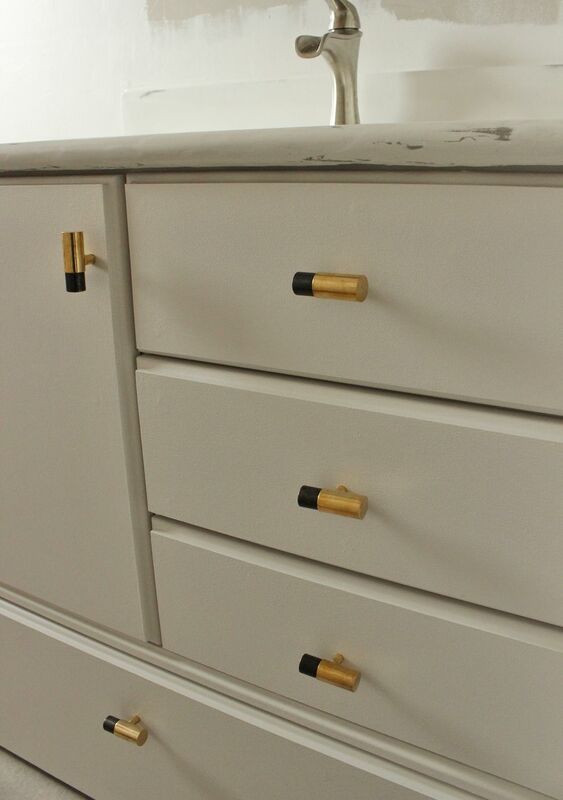 It’s nice when the knobs you love are a perfect fit for the new drawer faces. But what about when they aren’t? 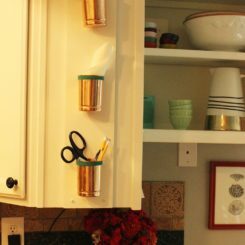 If your knob thread posts are too short for the new, thicker drawer faces, here’s what you do. 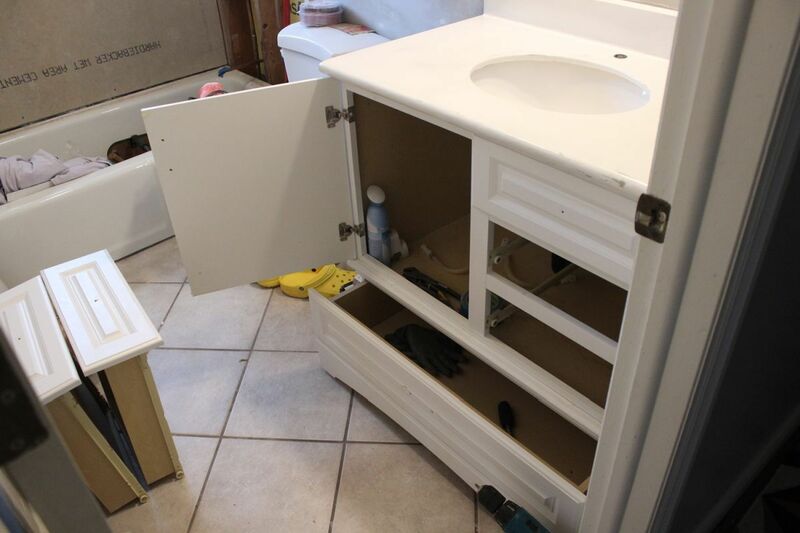 These photos are a bird’s eye view of the drawer front, where the tan part is the inside of the drawer and the white is the drawer face. 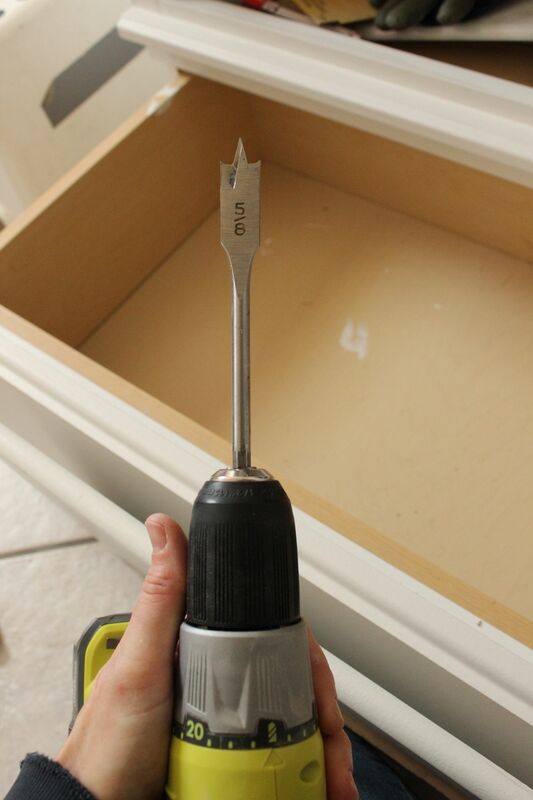 Without drilling, hold the spade bit up to the drawer face (from the inside of the drawer) to see how deep you will need to drill. 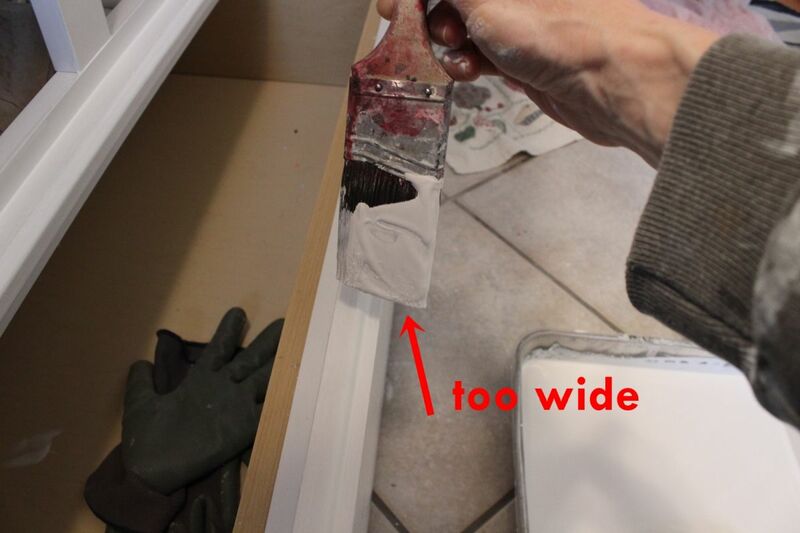 This particular drawer had two pieces of particle board BEFORE the original drawer face, so it was extremely thick. I knew that I needed to get through those two particle boards with the spade bit, but not into the original face. 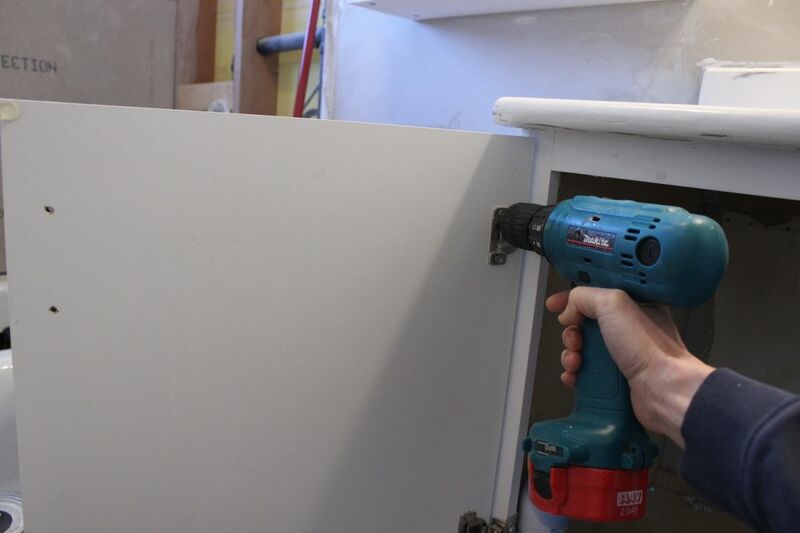 Holding the drill perpendicular to the drawer front, and using the original hardware hole as a guide, drill a large (hopefully 1”) hole through the necessary boards. 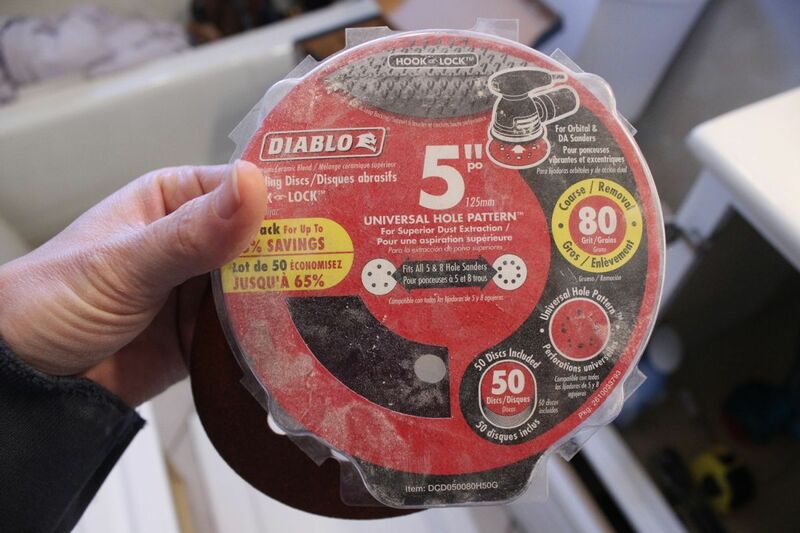 The idea here is to make a large enough hole from the inside that you can attach the knob’s nut to the threads from the inside of that large hole. 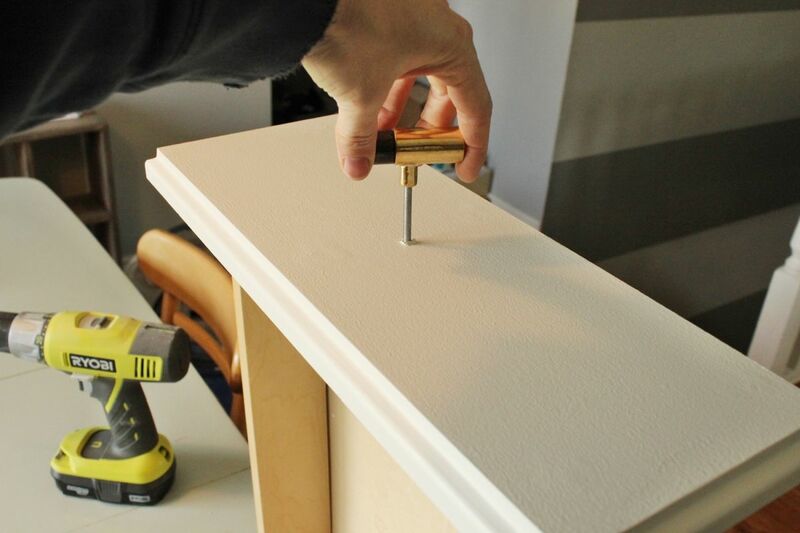 Switch back to your regular thread-matching drill bit, and use the original hole as your guide still to drill through the new MDF face. 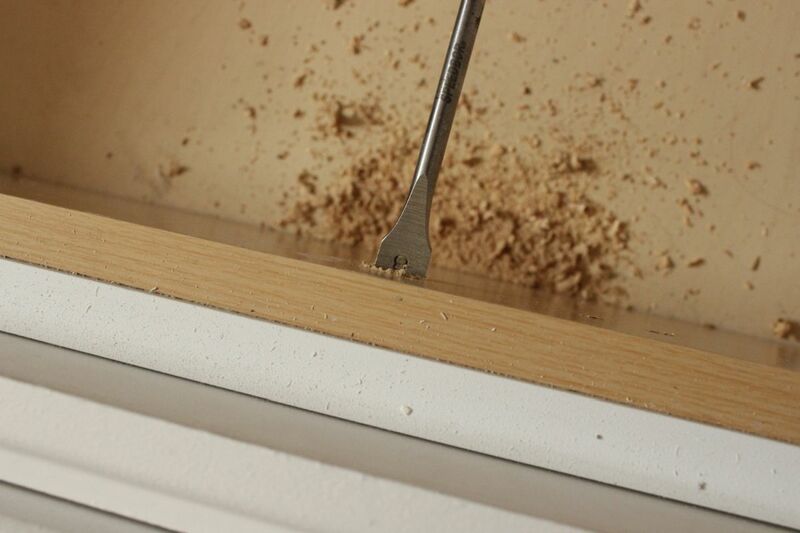 Don’t forget to push your old board up against the drawer face as you do this so you get a clean drill hole in front! Considering the awkward angles required to drill everything perpendicular and straight in this instance while holding an old board in place, I’m pleased with the cleanliness of this drilled hole. Begin threading in your knob. 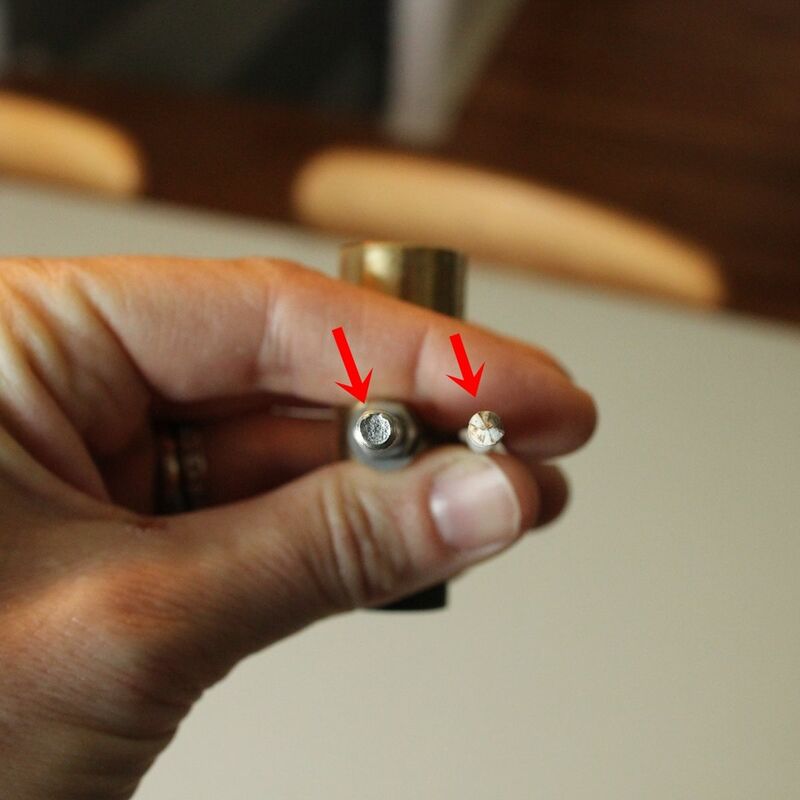 Hold the nut in place in your newly drilled larger hole with some needlenose pliers. Tighten everything as needed. 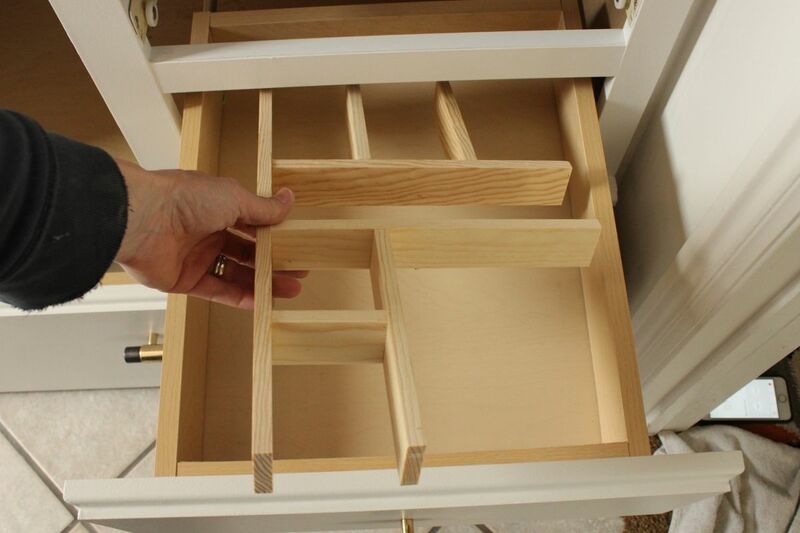 Replace your vanity’s drawer and cabinet items, including your now-can’t-live-without DIY drawer organizers. Take a step back. Wow. Look at the difference! Remember what it looked like before? Your vanity had zero to little personality, pizzazz, or pop factor. 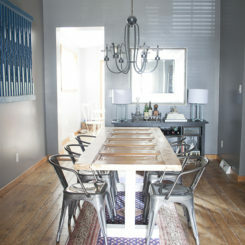 Now, thanks to a little elbow grease and some simple touches, it looks like a million bucks. 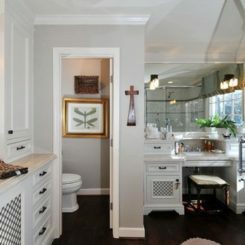 A custom piece that matches your bathroom’s style flawlessly. 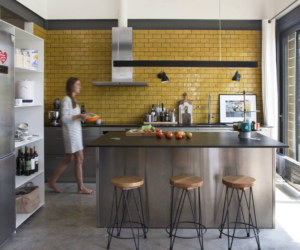 A little gold hardware goes a long way. Congratulations! 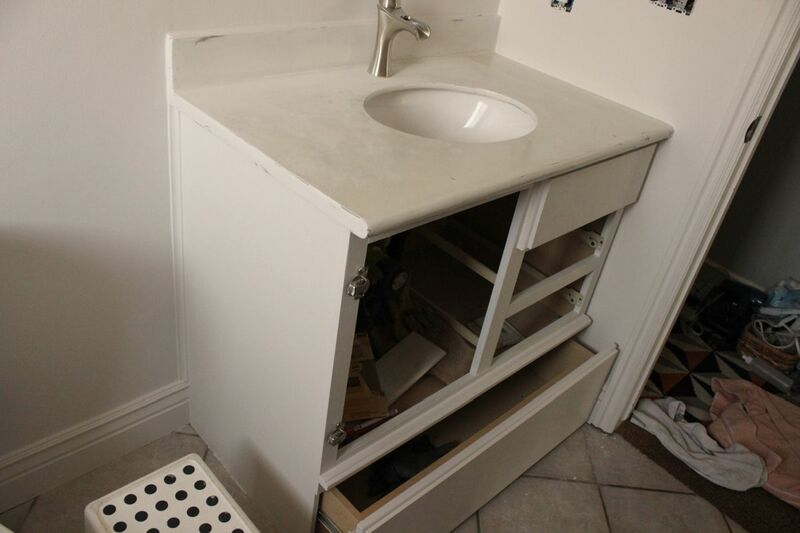 We hope you enjoy your “new” chic and customized bathroom vanity.